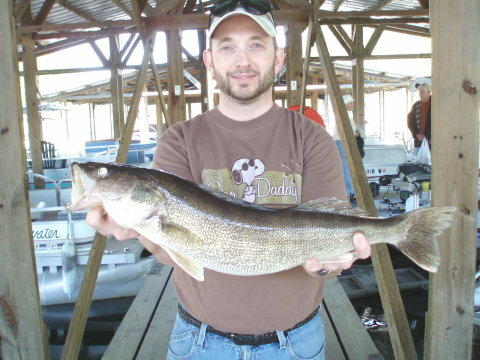 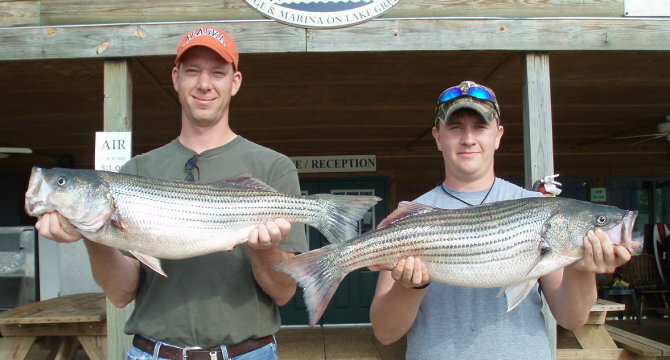 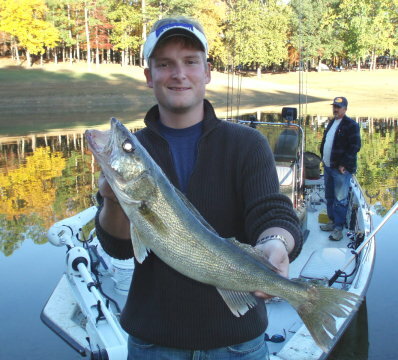 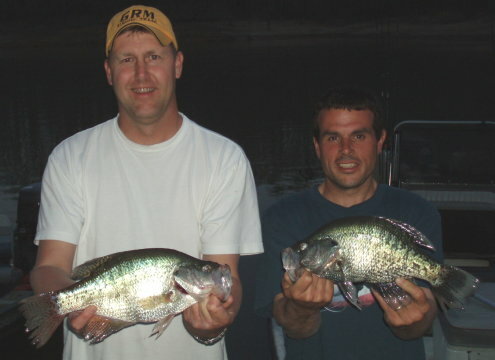 Below are some of the bigger and more rare fish caught during our trips in previous years. 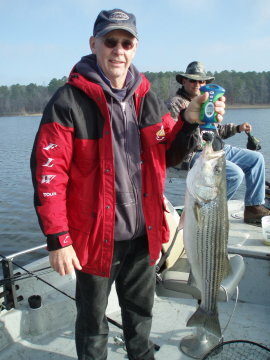 The biggest Yellow Bass I've ever seen - just over one pound - tough fighter and tangled many lines - good times! 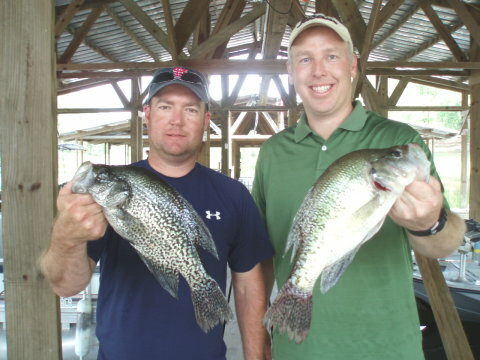 Two 15's and a 16"
Mike landed these two fine black crappie that weighed nearly two pounds. 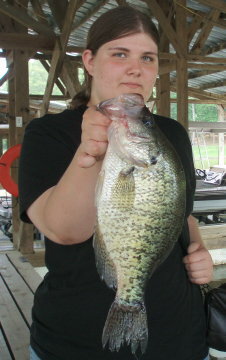 15.75" Black Crappie that weighed 2lbs.6ozs. 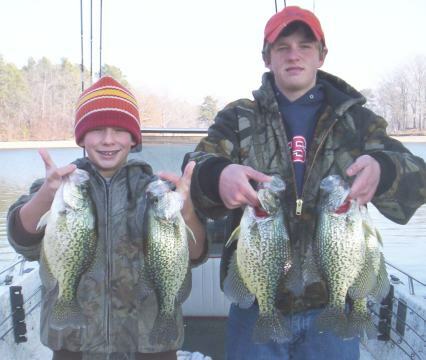 (Left) 2lb. 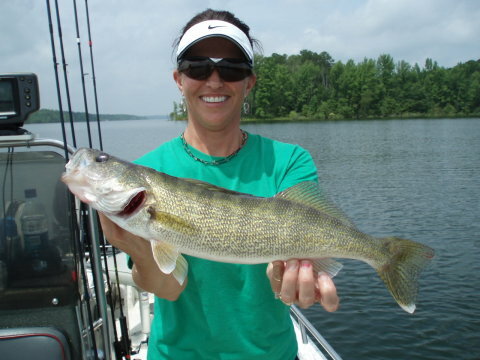 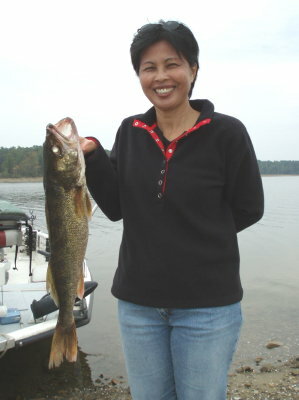 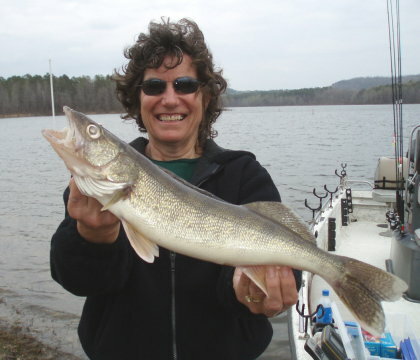 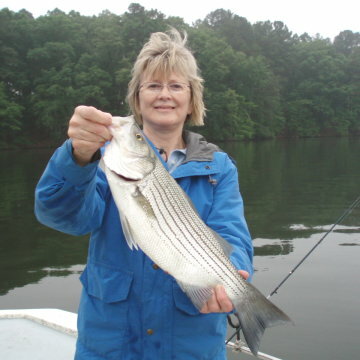 female and a 1.5lb. 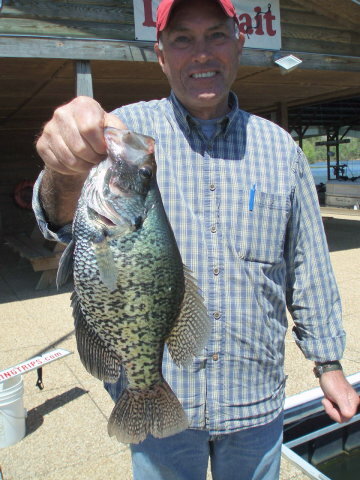 male Black Crappie. 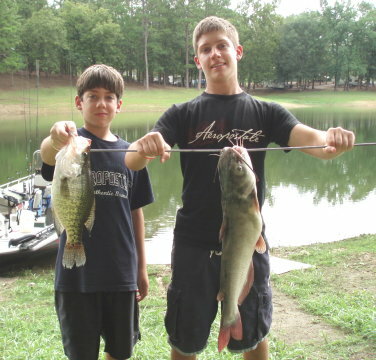 (Right) 1.75lb. 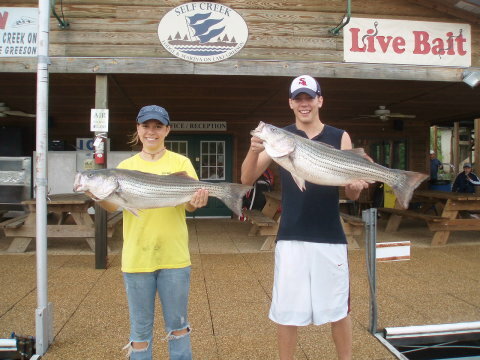 male and a 17"-2.75lb. 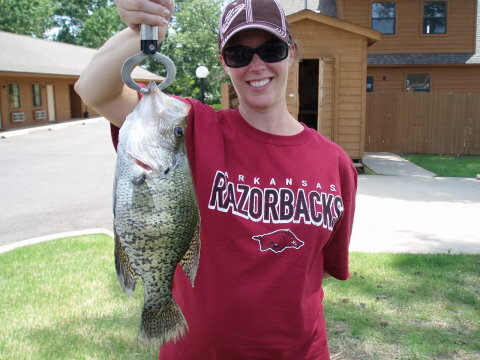 female Black Crappie. 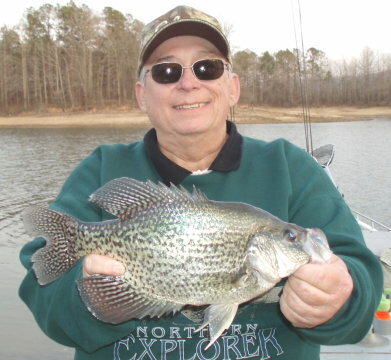 Black Crappie -- 14.75", 14.5", and two 14"
Really thick and healthy fish. 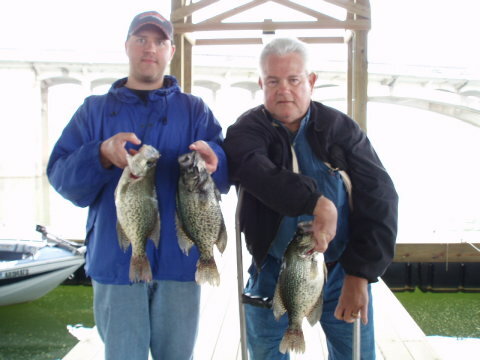 White Crappie -- 16.5" and 16"
Hybrid Crappie -- 16" / 2lbs.3ozs. 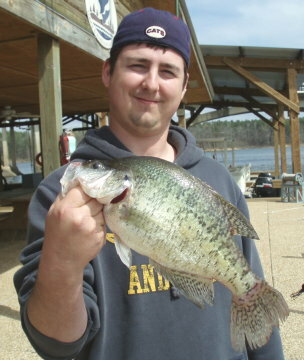 White Crappie - 16.25" - 2lbs.1oz. 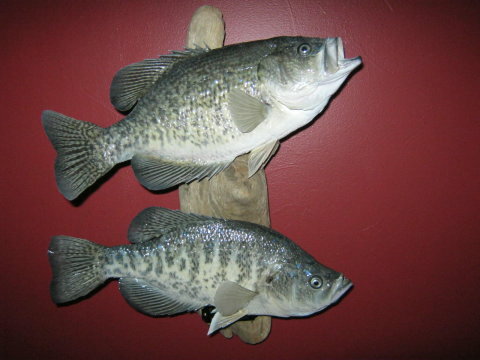 White Crappie male and female - 2lb.2oz. 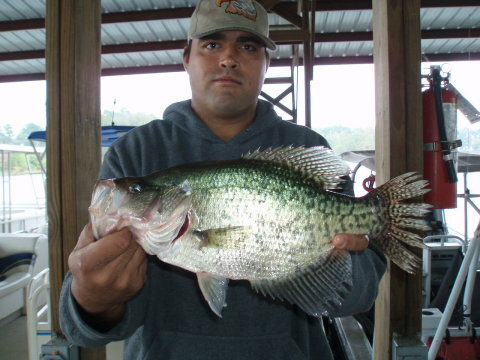 and 2lb.1oz. 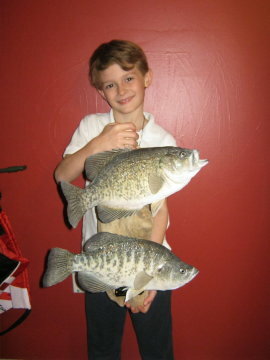 White Crappie - 15.5" - 2lbs.2ozs. 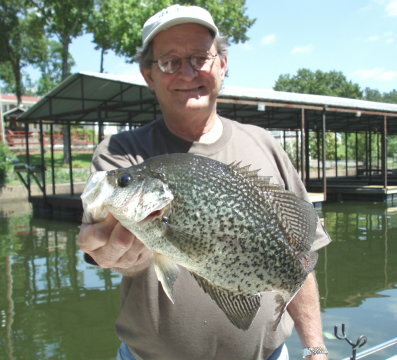 White Crappie -- 2lbs.5ozs. 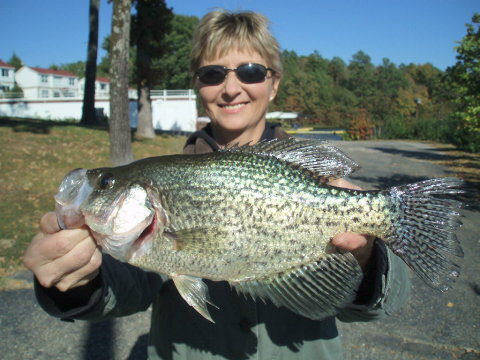 and 2lbs.8ozs. 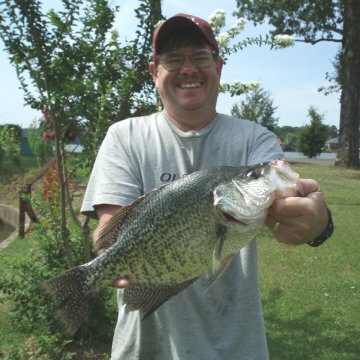 Black Crappie - 16.25" - 2lbs.12ozs. 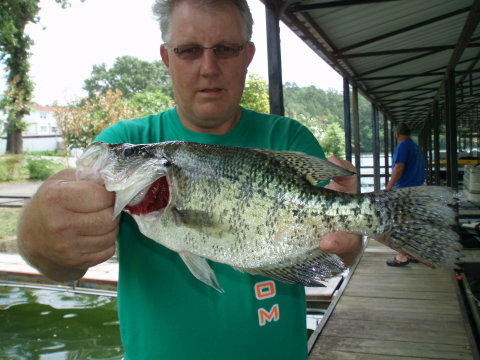 Black Crappie - 2lbs.6ozs. 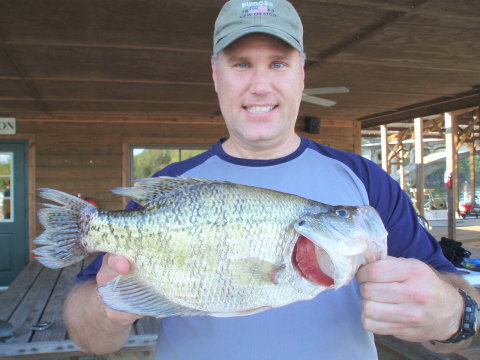 and 1lb.14ozs. 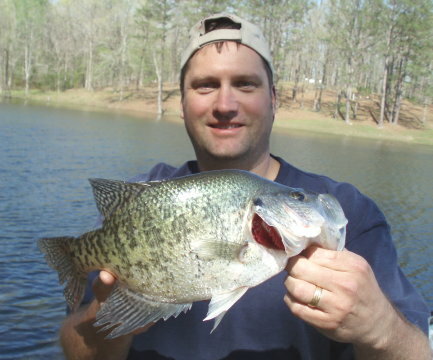 Black Crappie - 2lbs.3ozs. 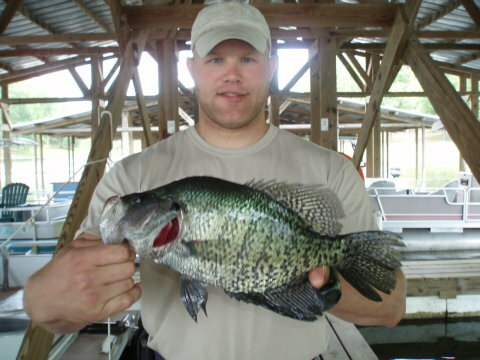 and 1lb.14ozs. 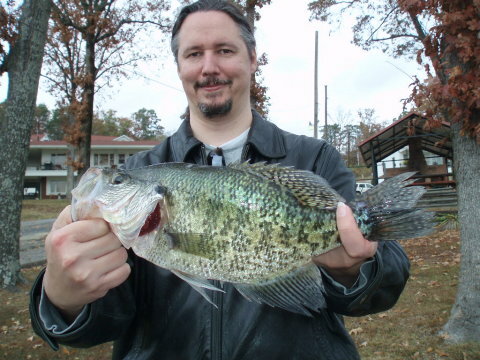 Black Crappie - 1lb.14ozs. 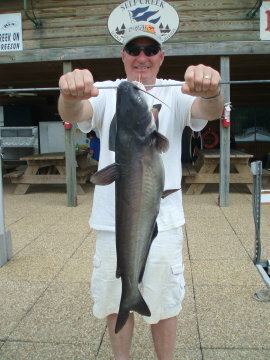 and 2lbs.7ozs. 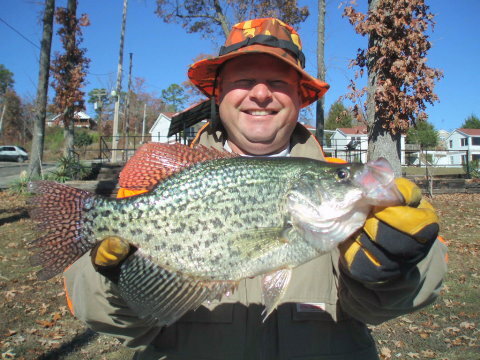 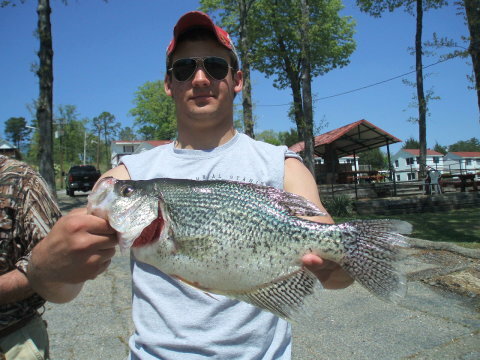 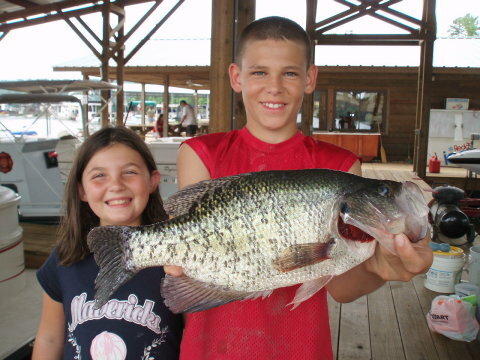 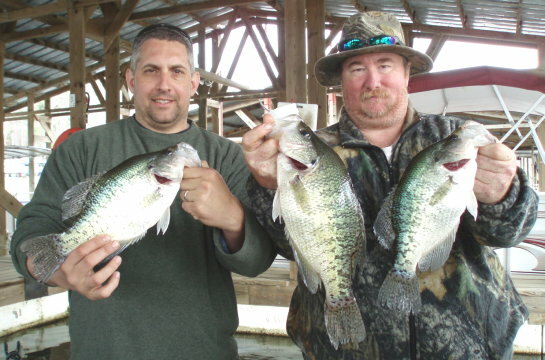 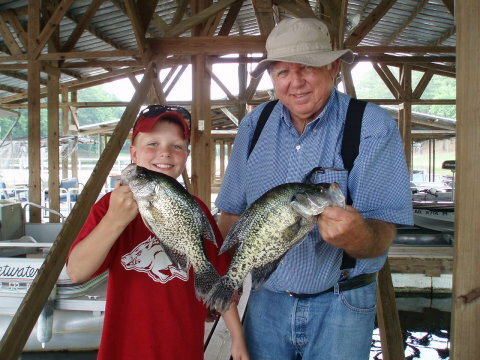 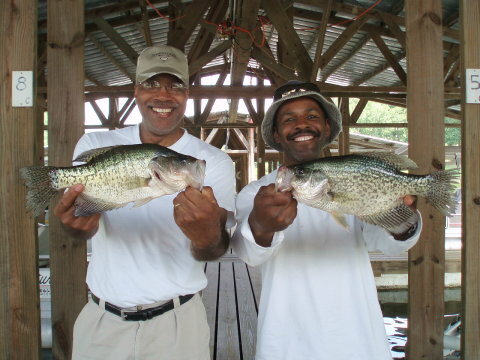 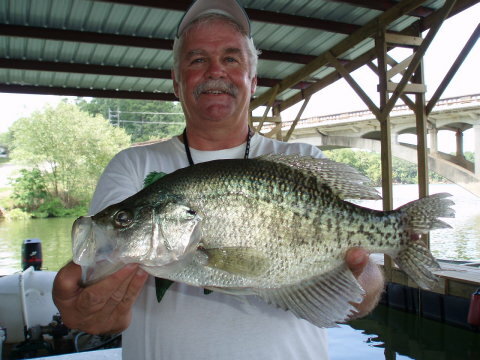 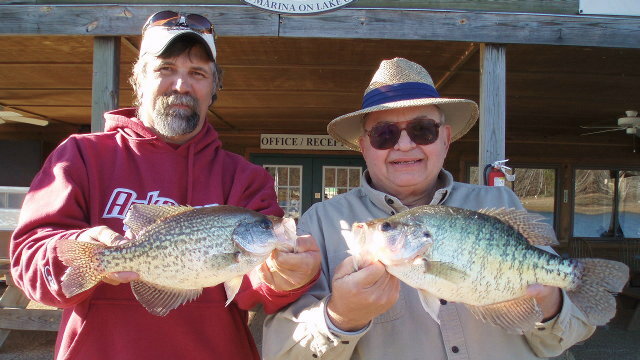 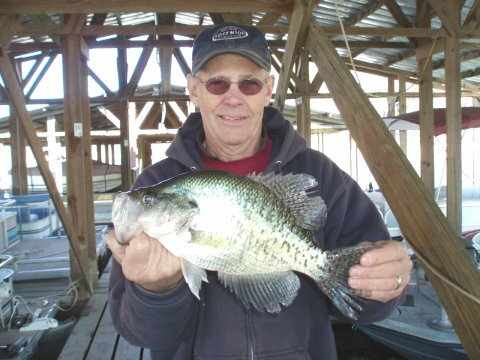 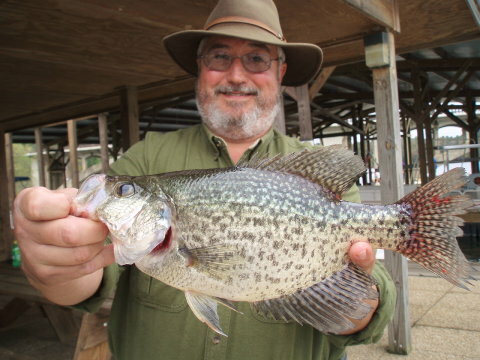 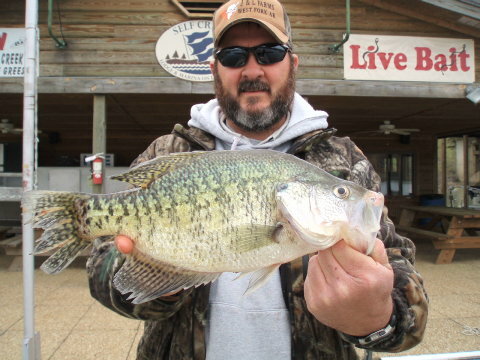 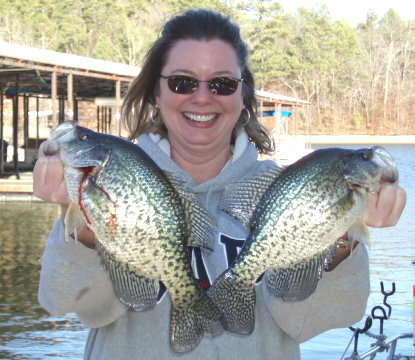 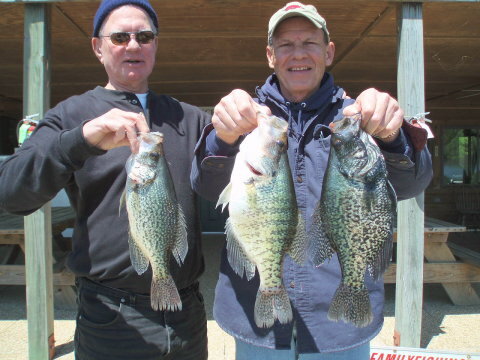 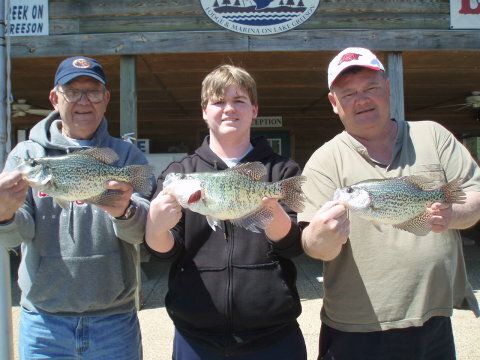 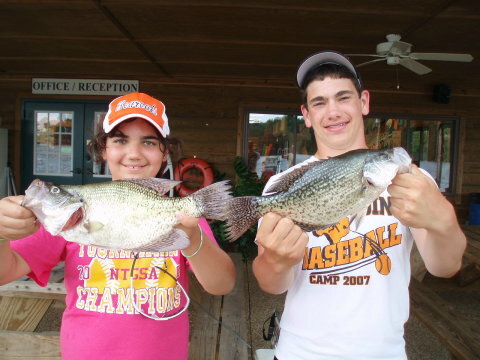 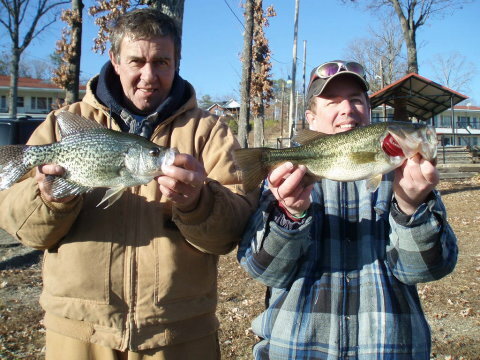 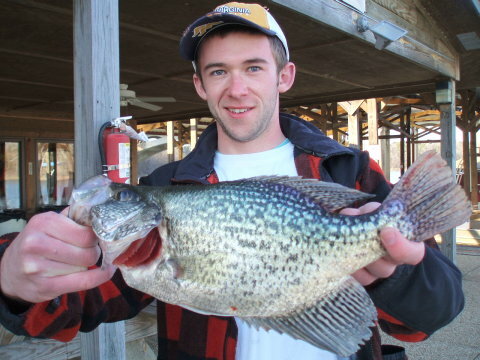 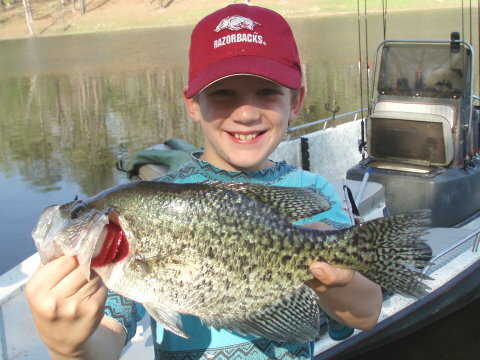 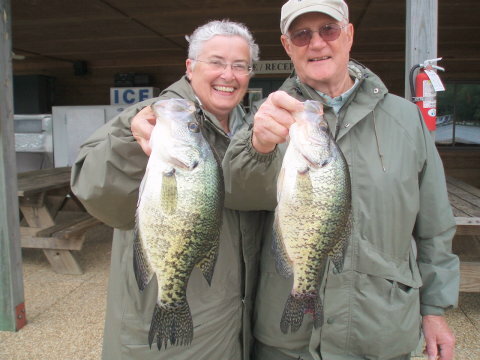 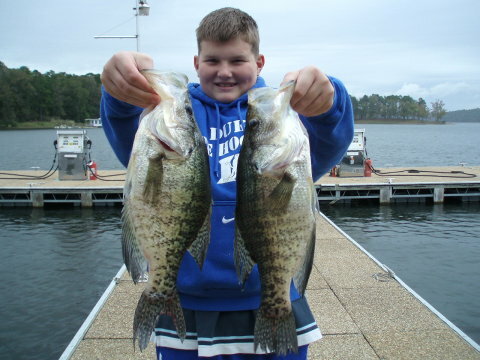 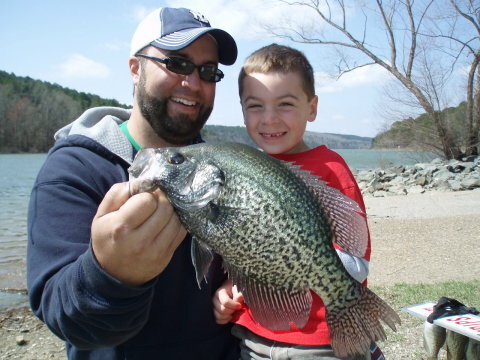 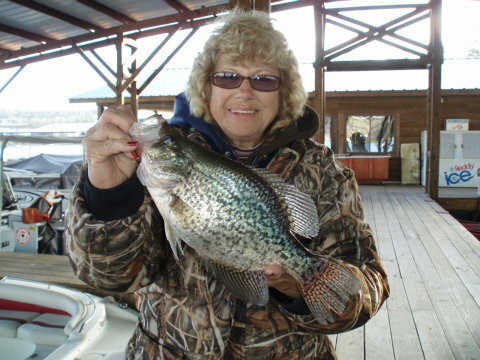 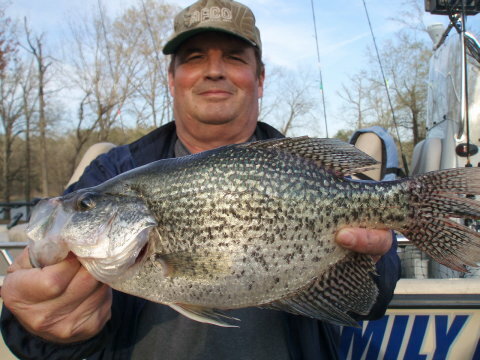 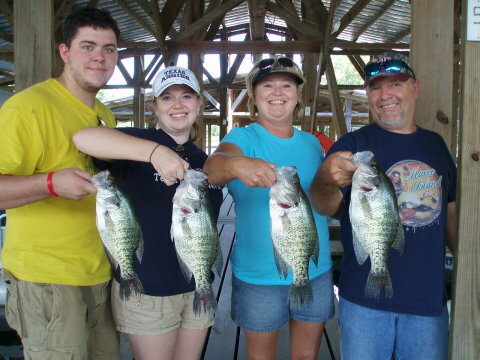 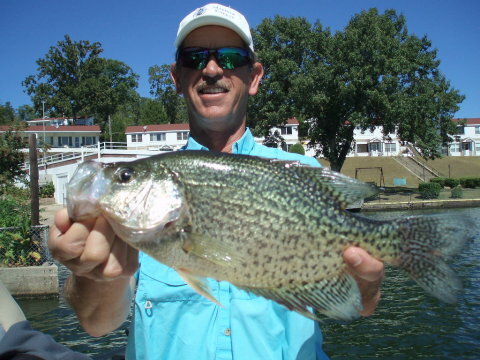 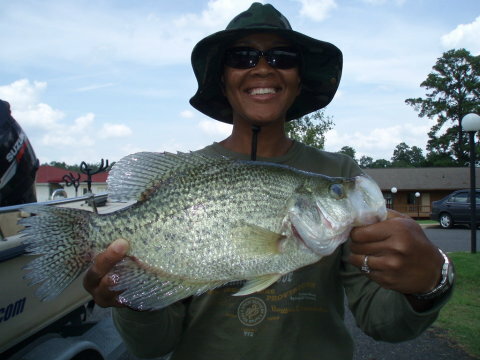 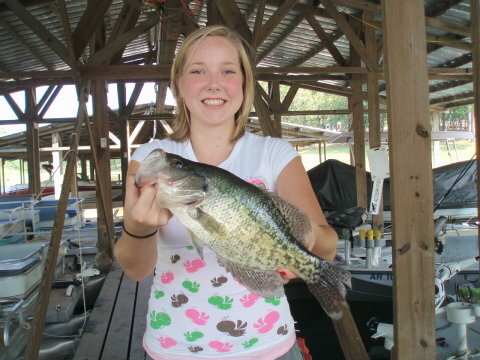 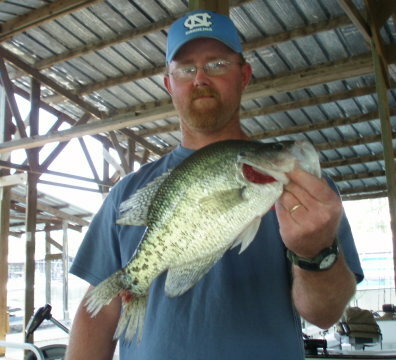 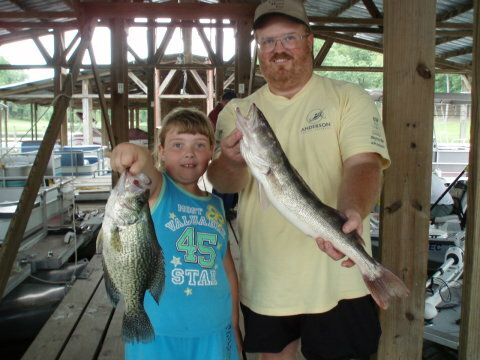 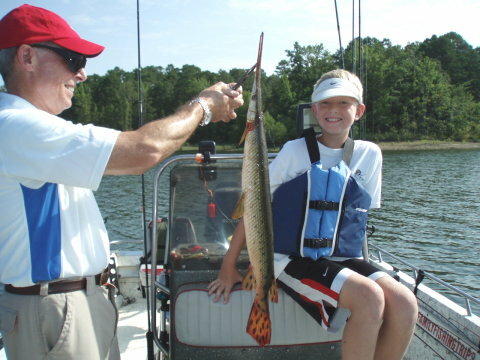 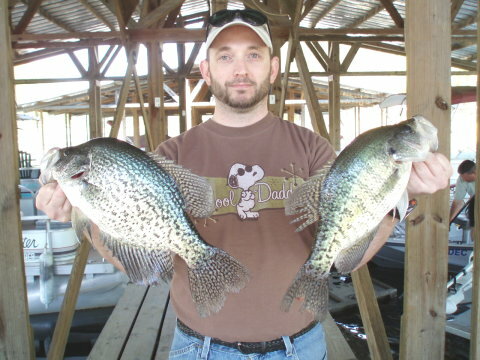 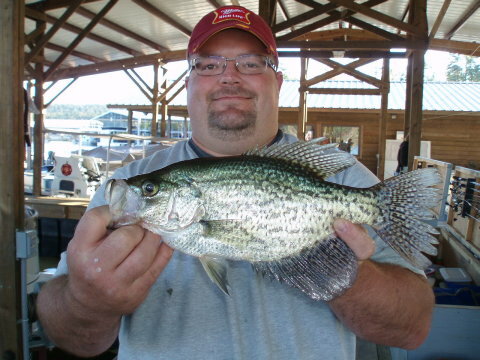 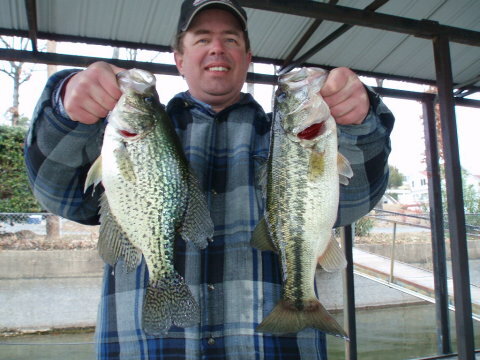 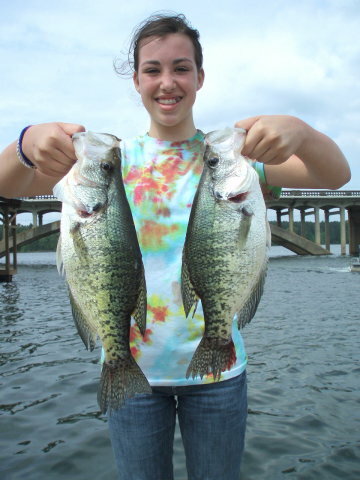 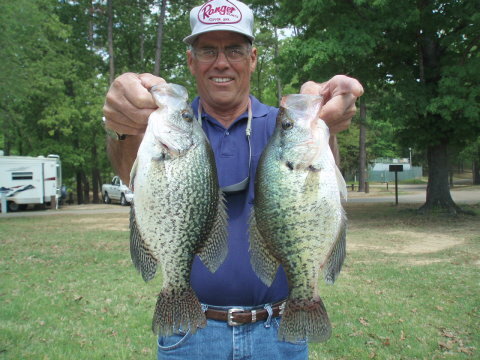 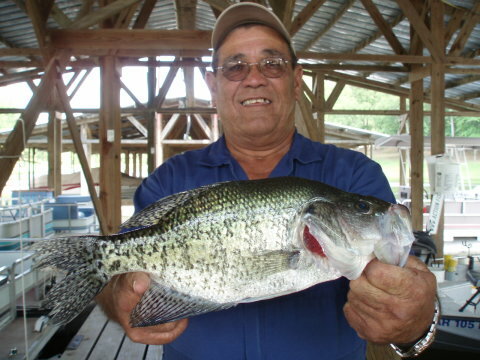 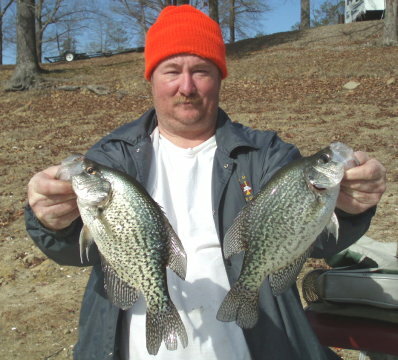 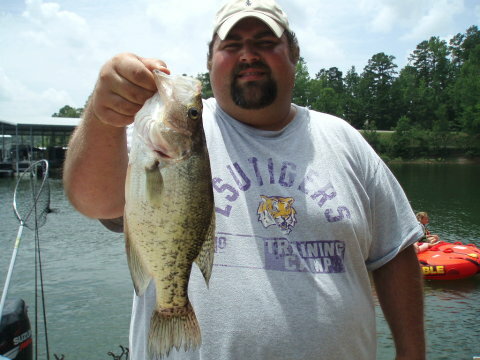 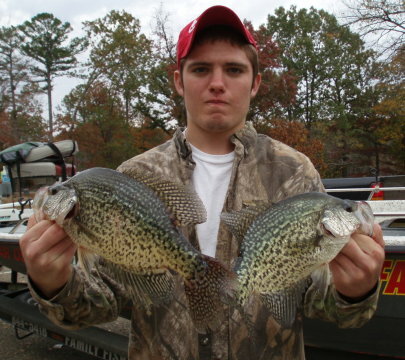 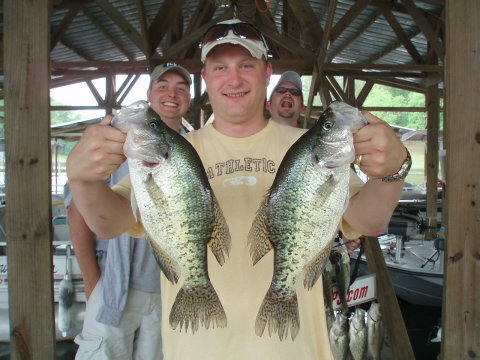 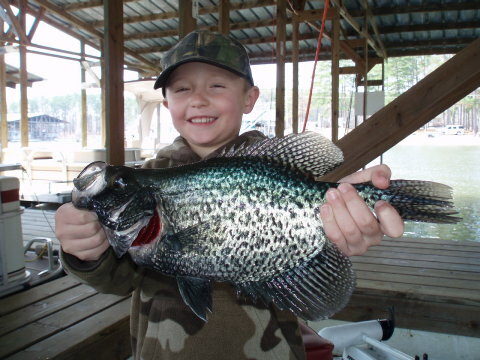 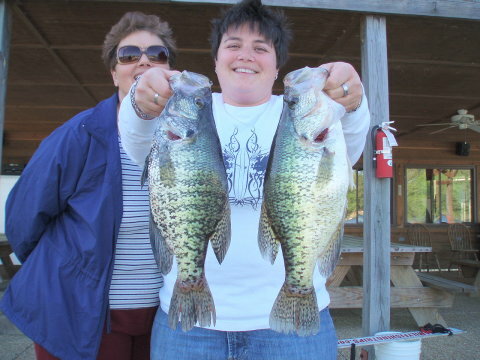 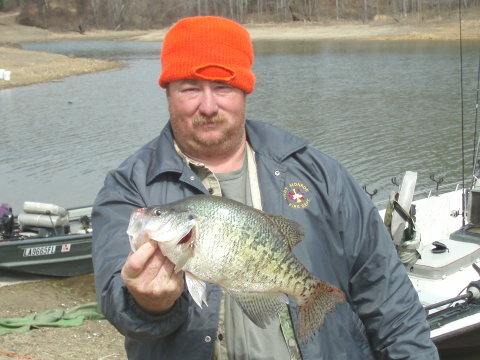 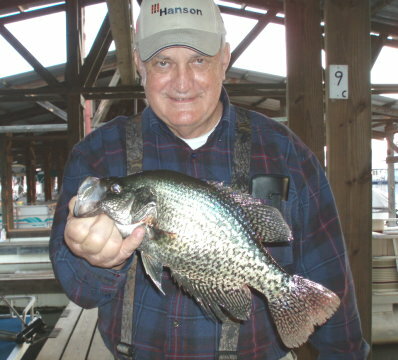 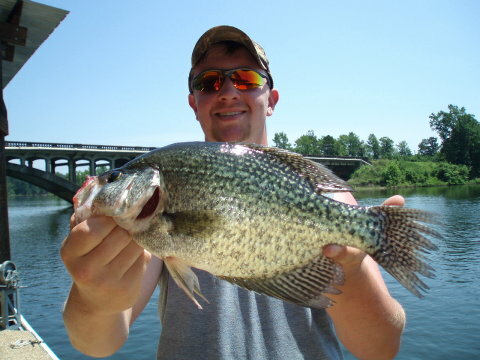 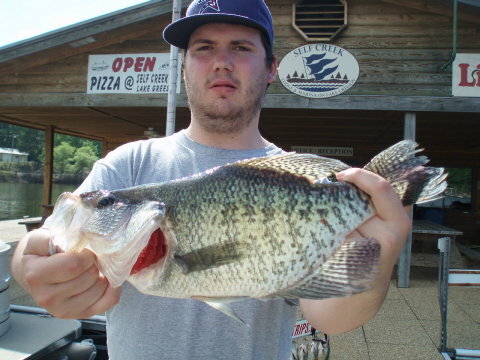 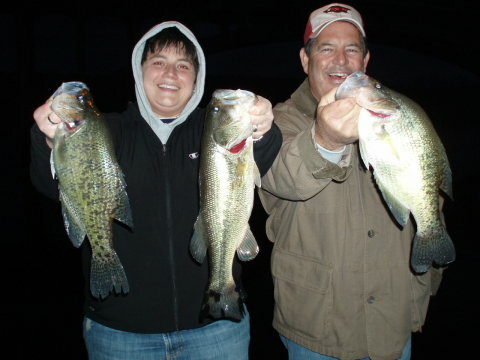 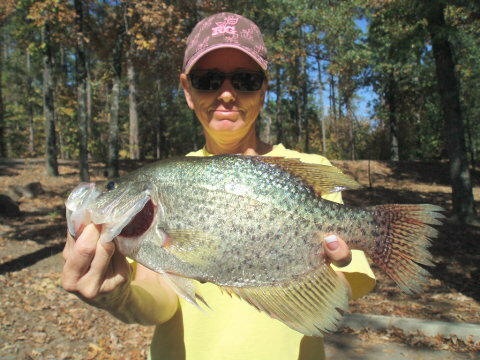 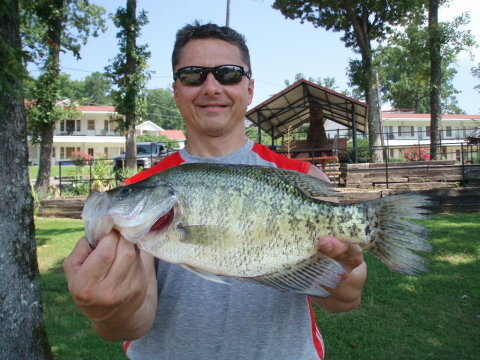 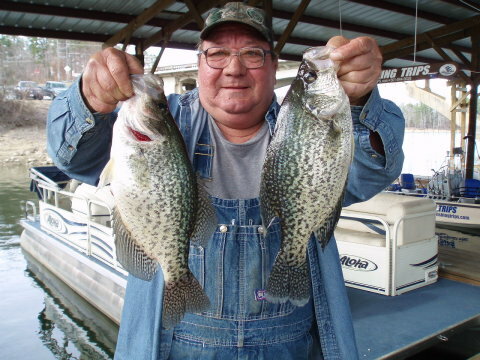 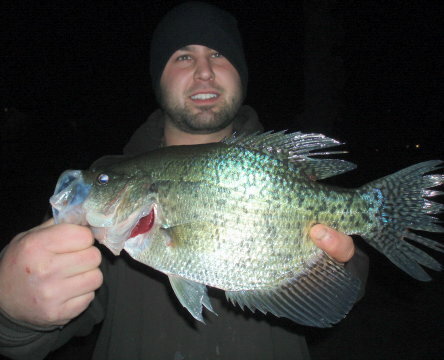 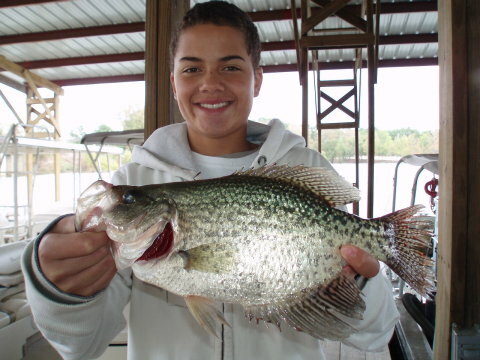 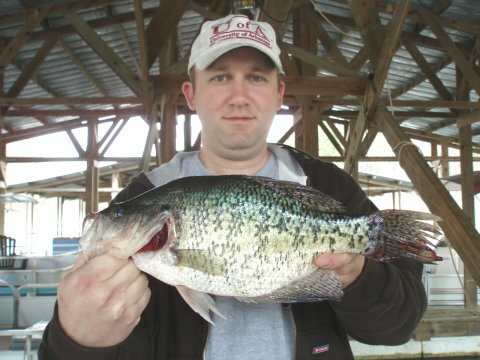 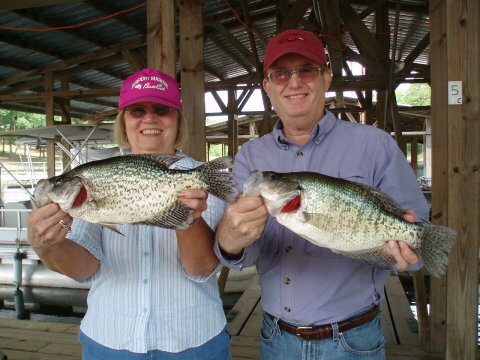 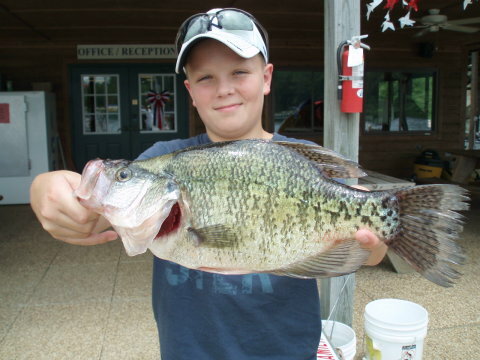 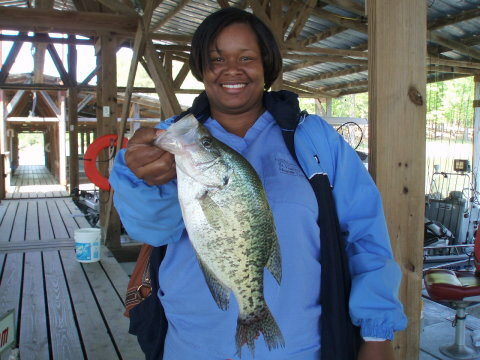 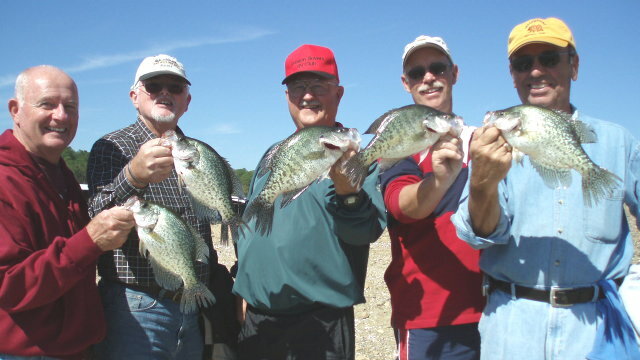 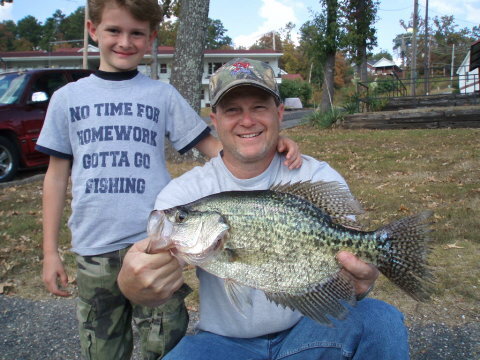 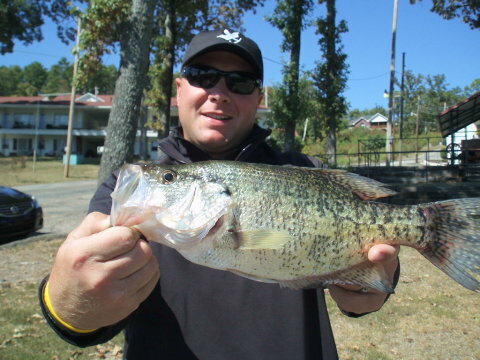 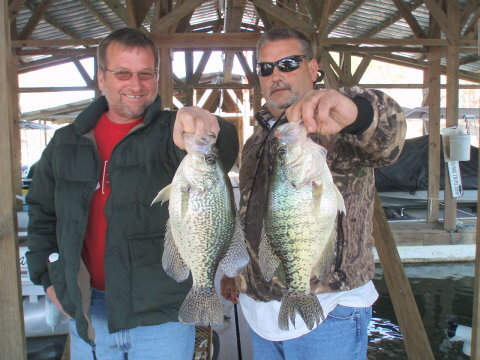 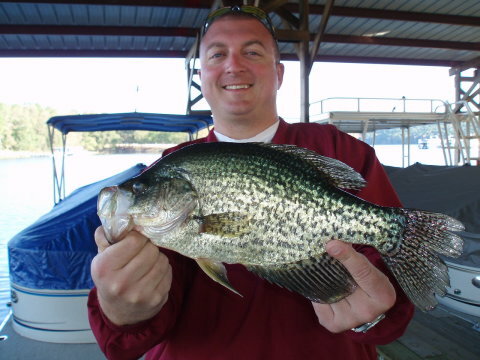 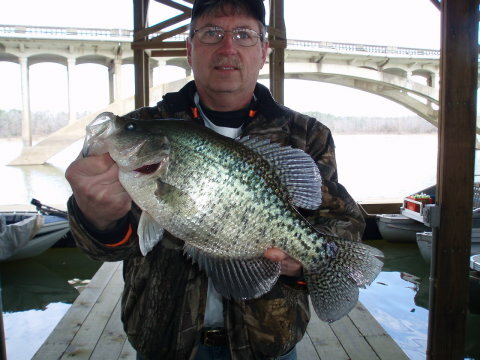 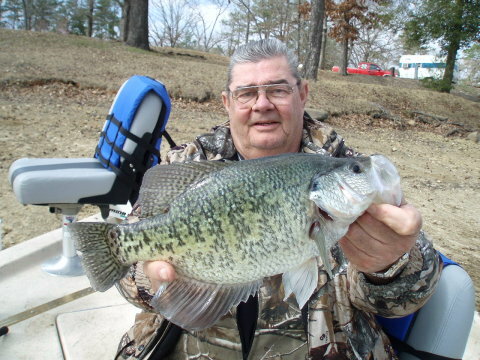 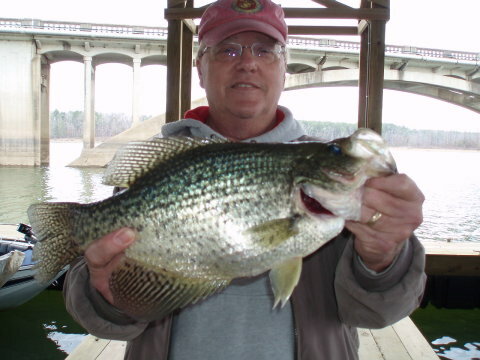 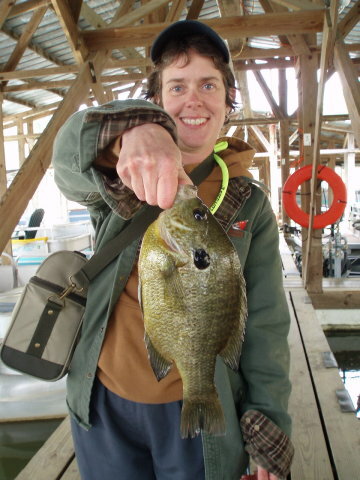 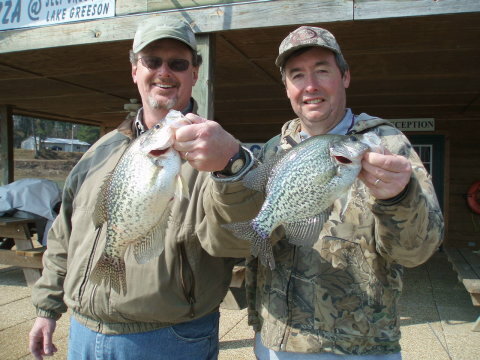 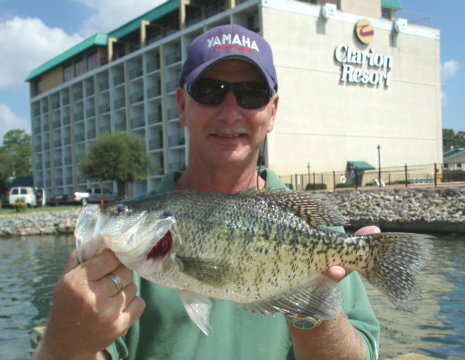 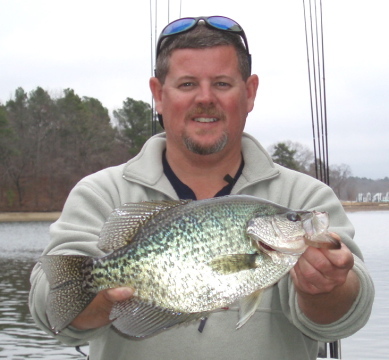 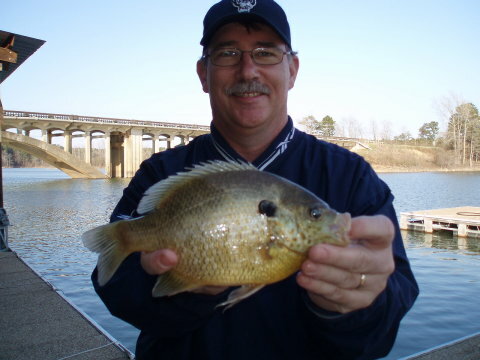 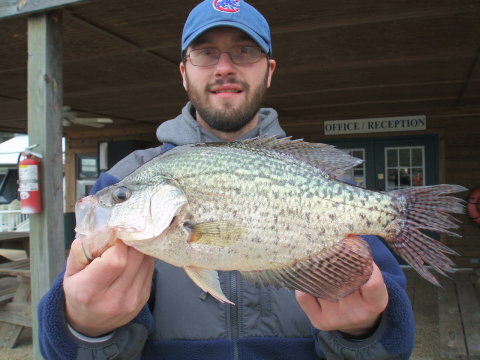 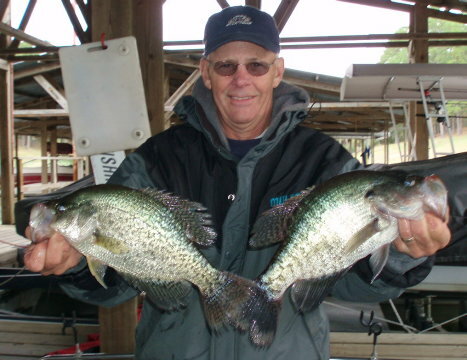 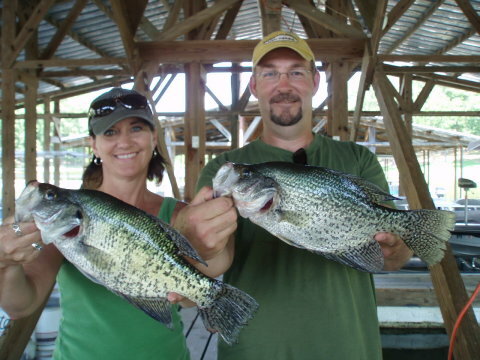 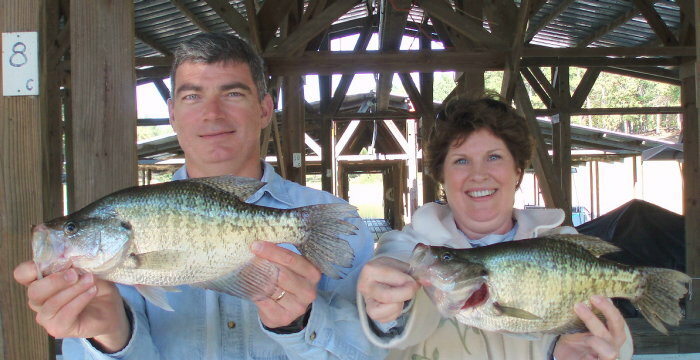 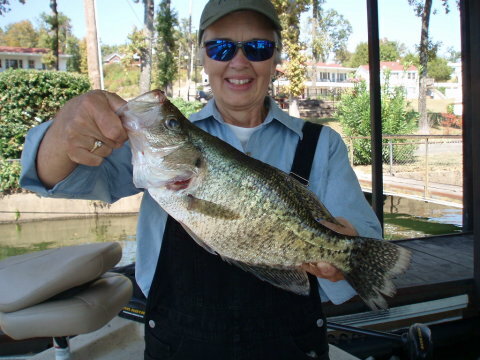 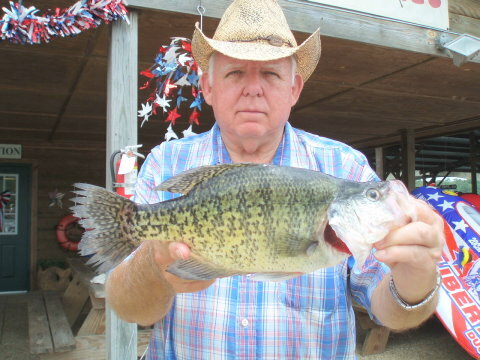 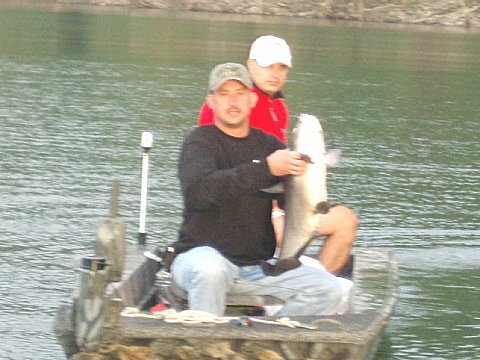 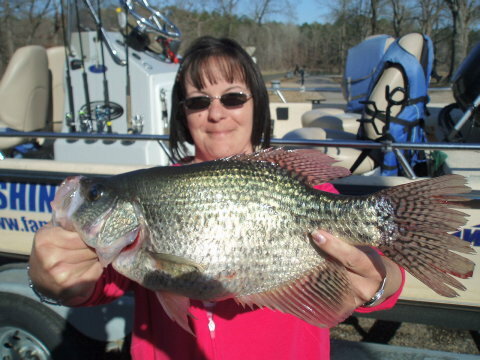 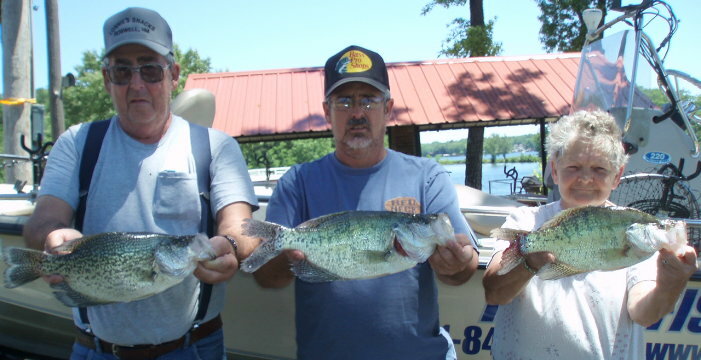 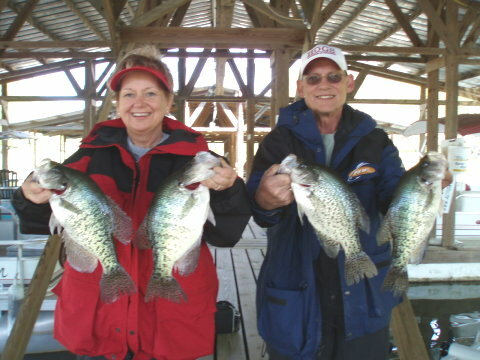 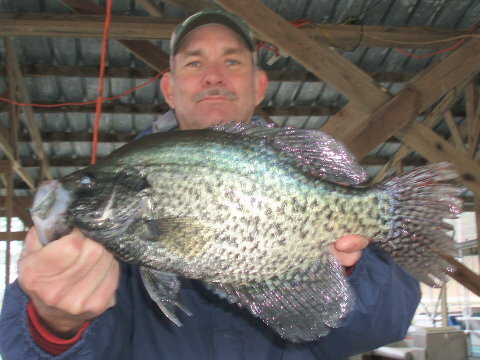 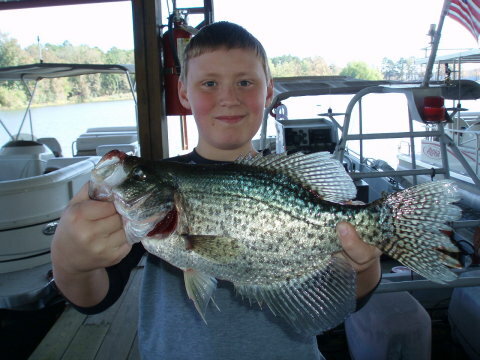 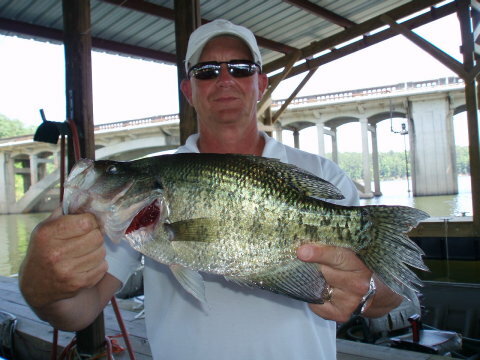 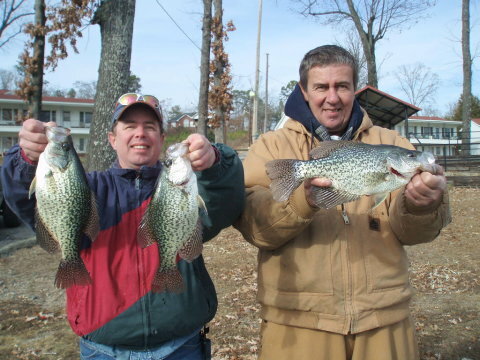 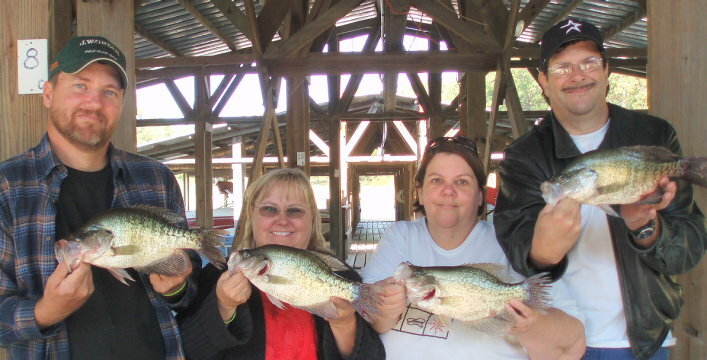 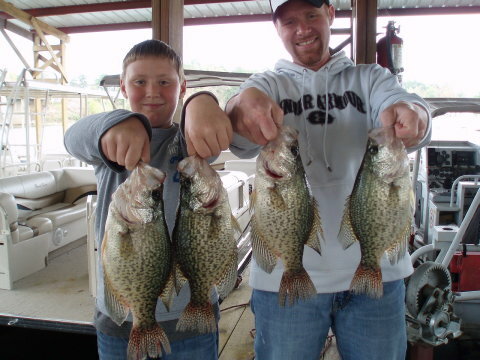 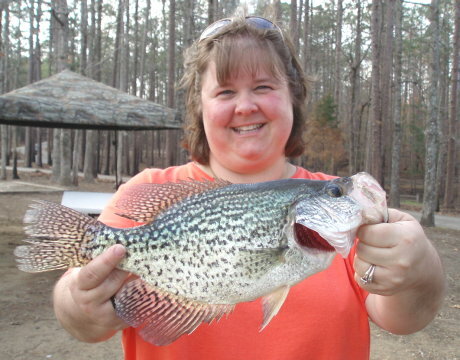 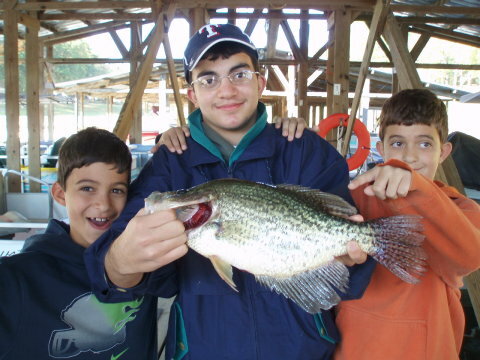 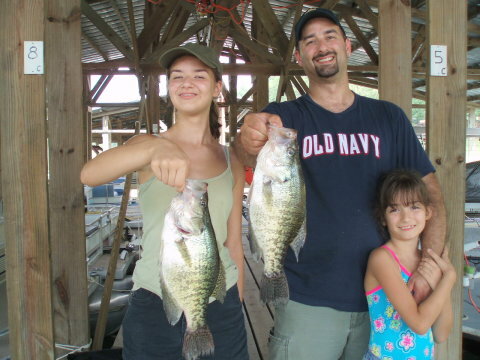 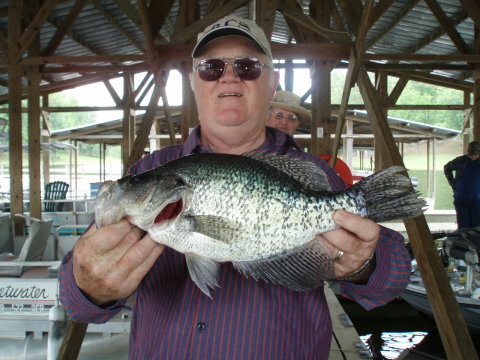 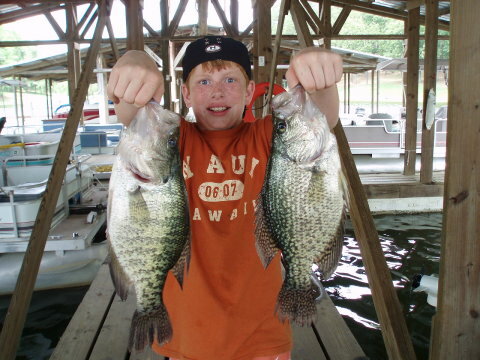 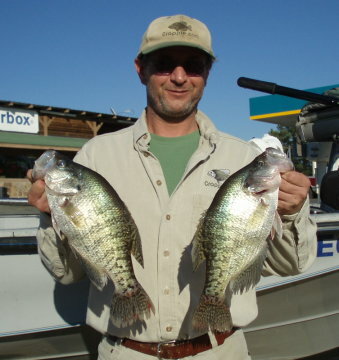 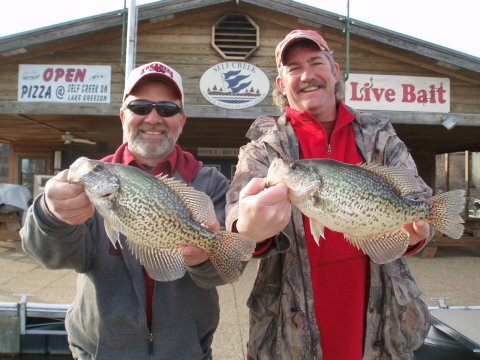 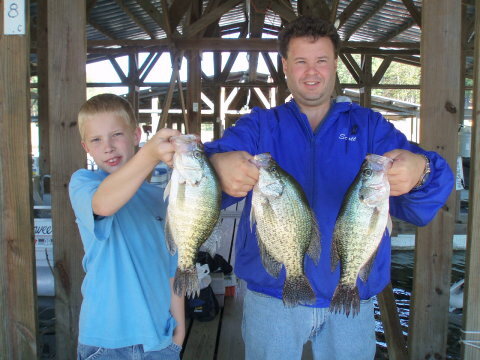 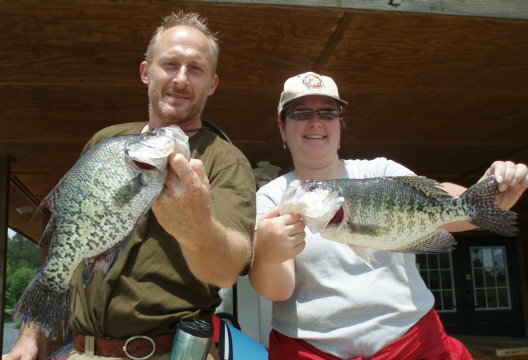 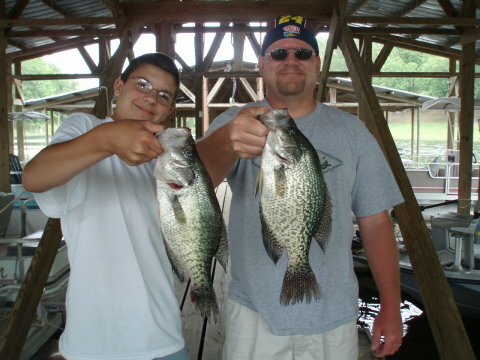 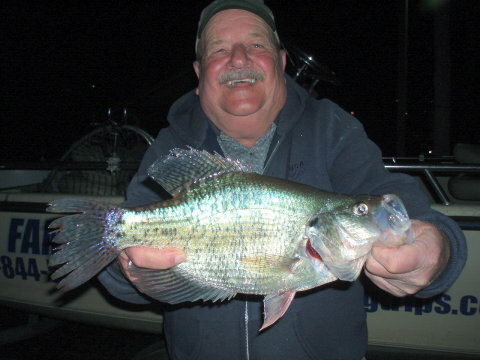 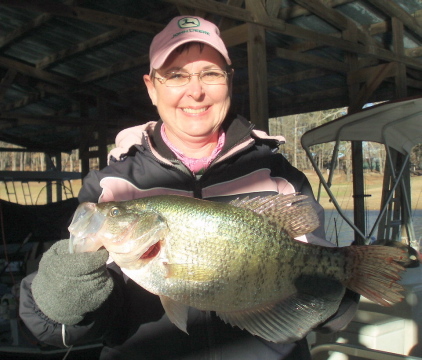 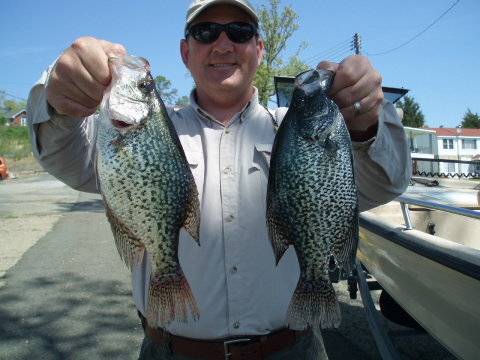 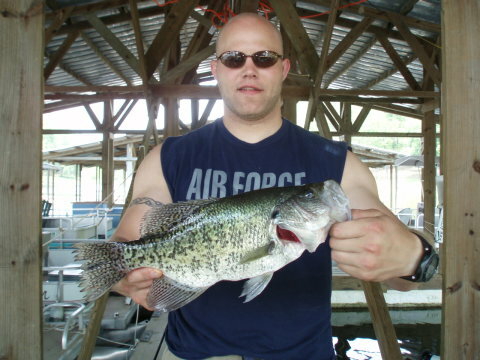 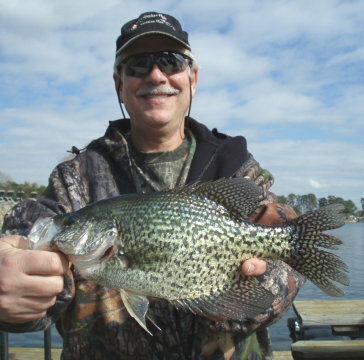 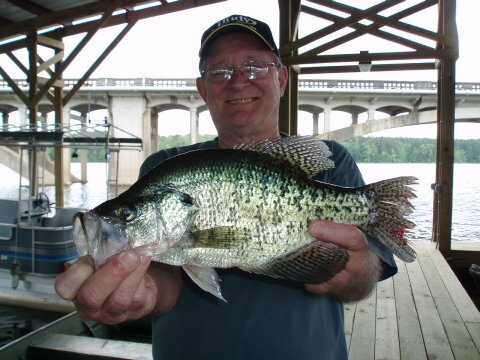 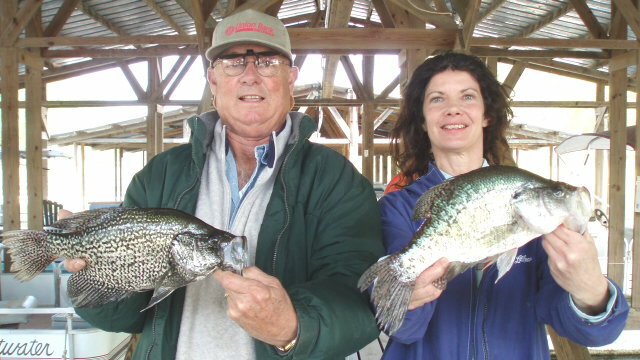 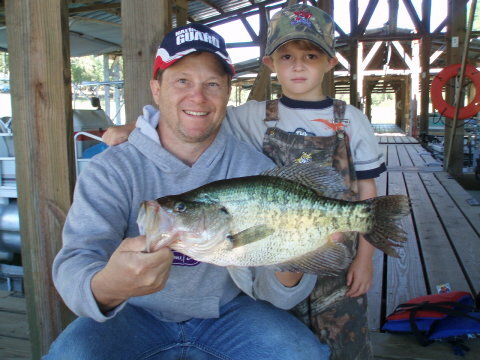 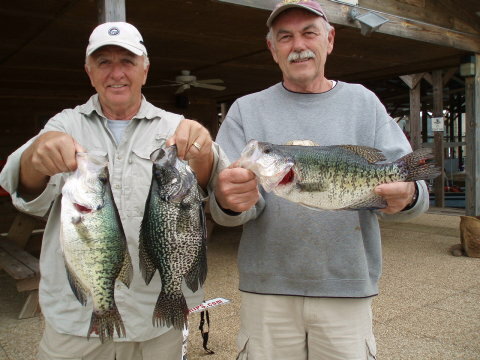 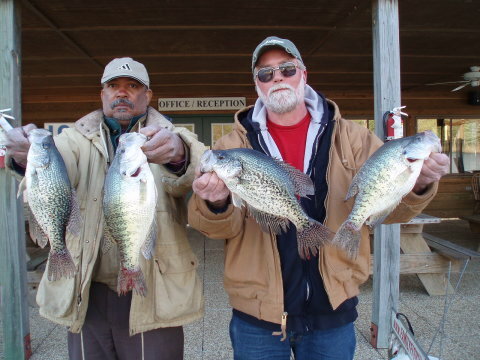 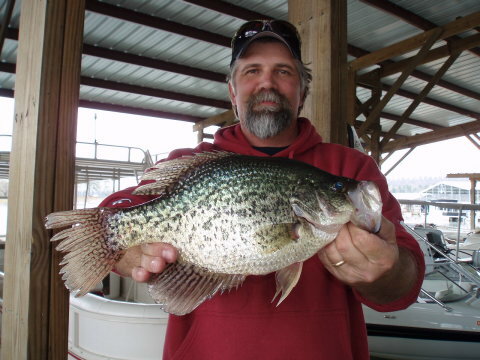 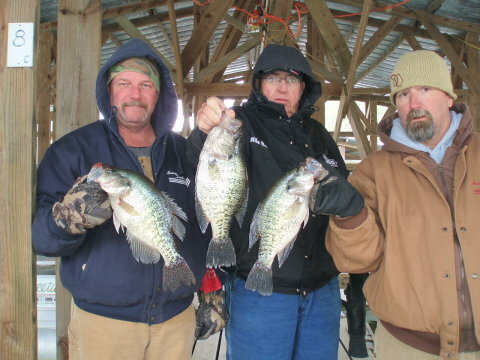 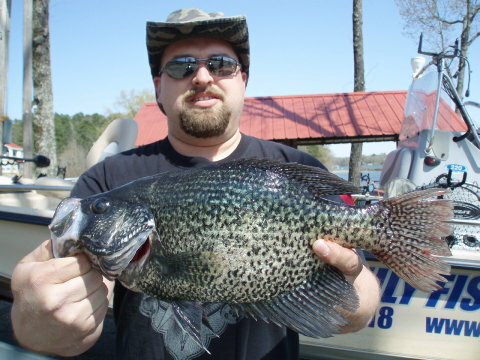 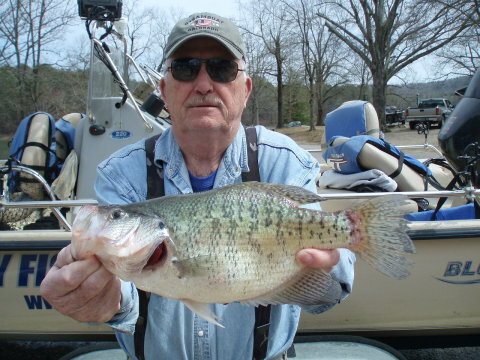 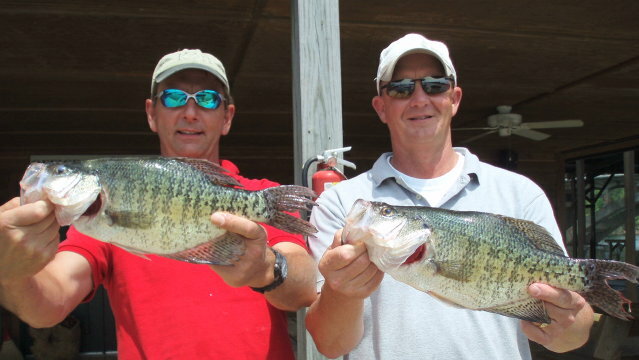 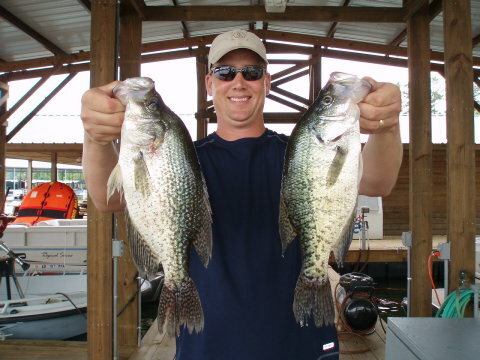 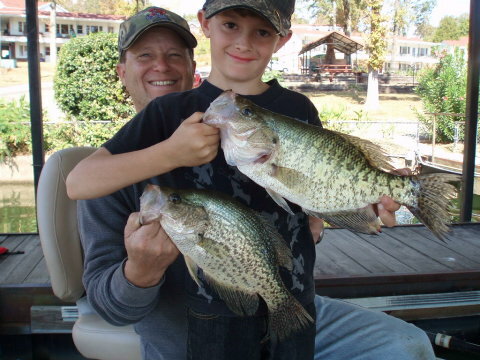 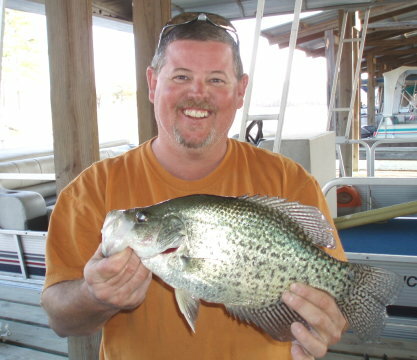 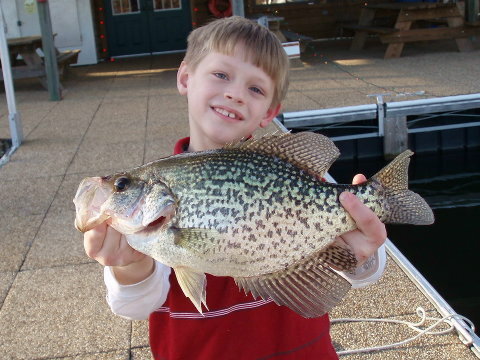 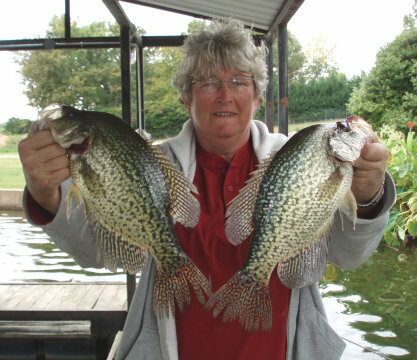 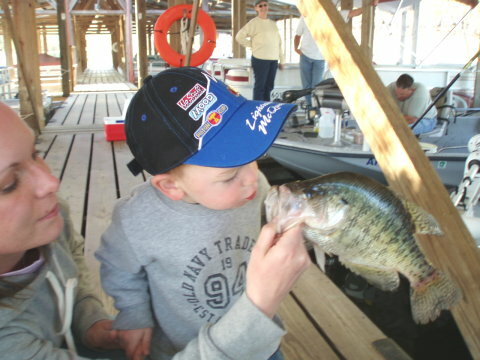 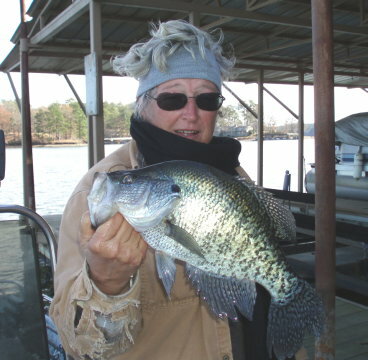 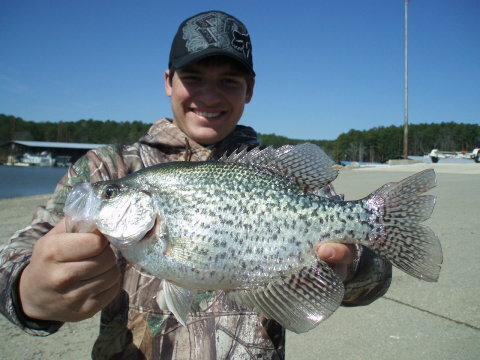 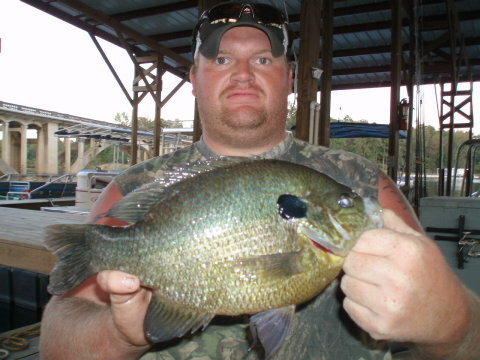 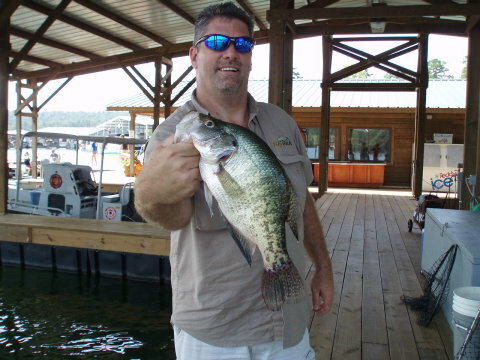 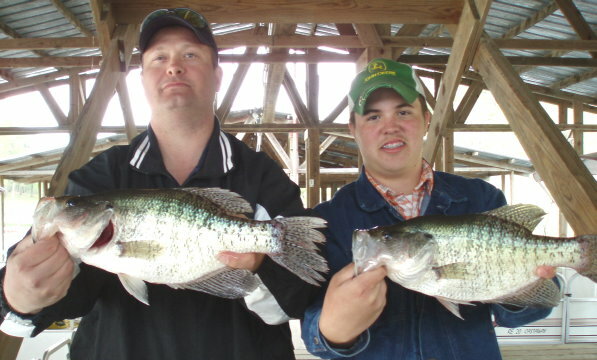 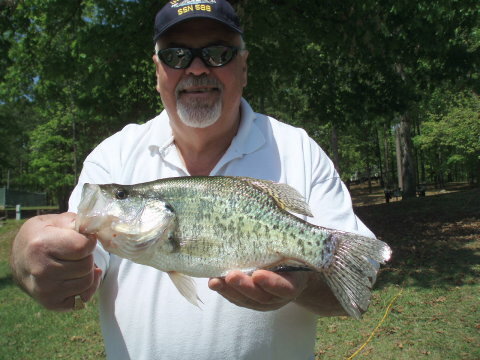 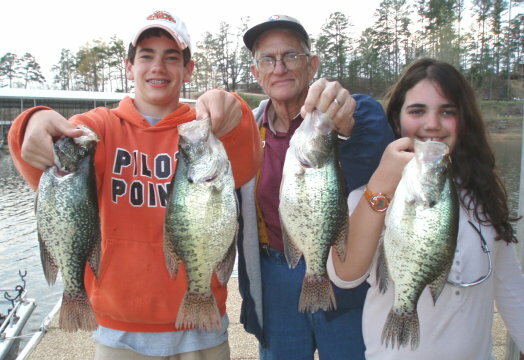 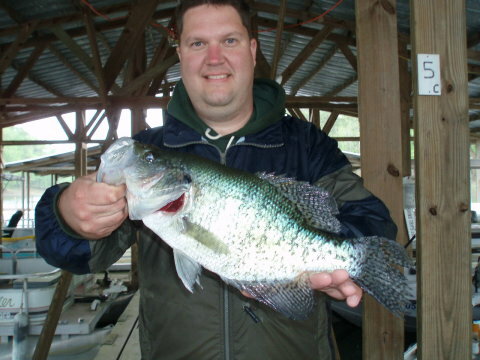 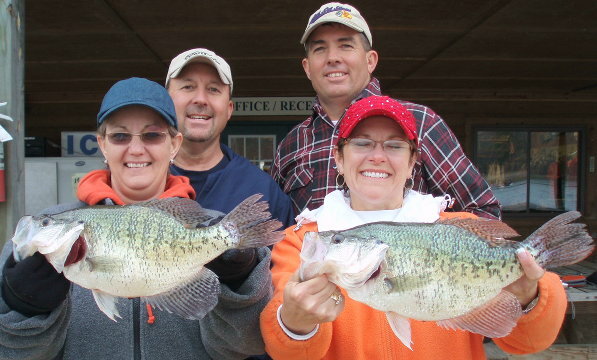 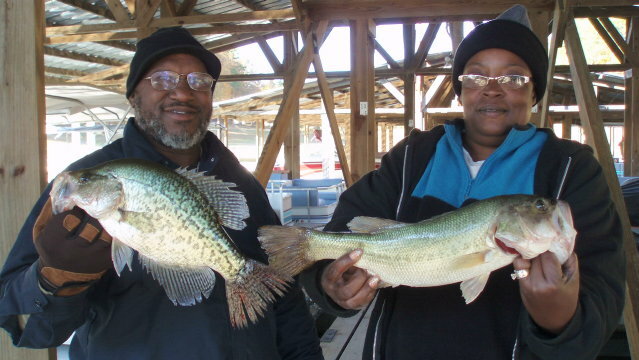 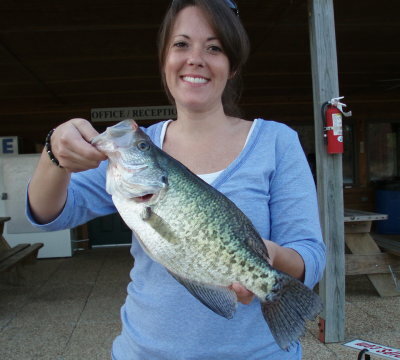 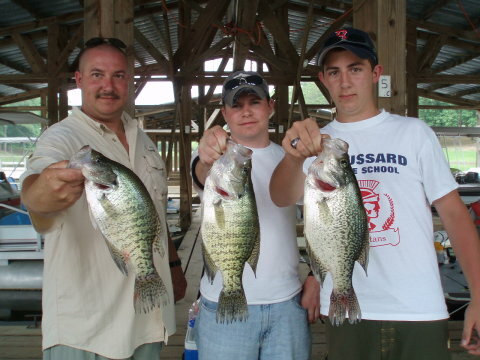 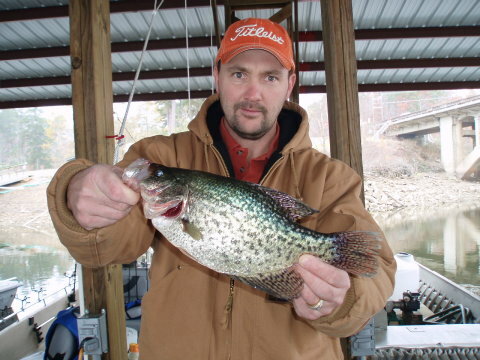 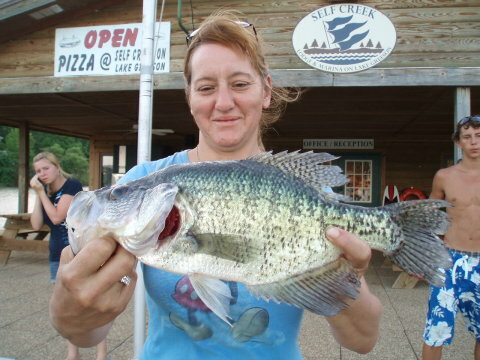 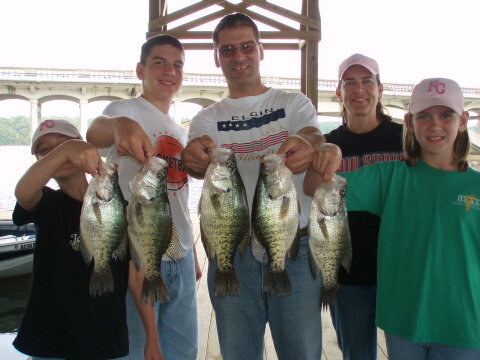 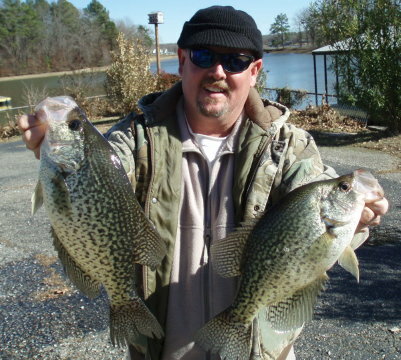 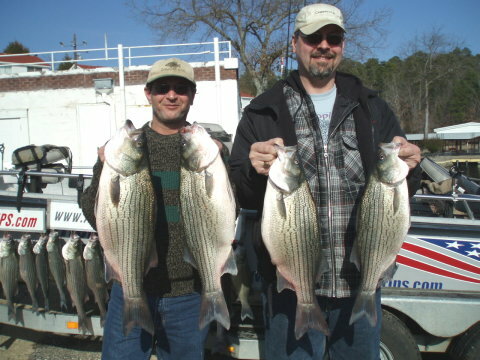 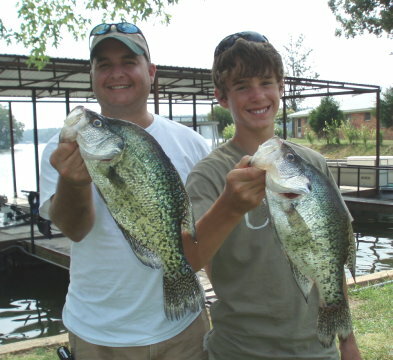 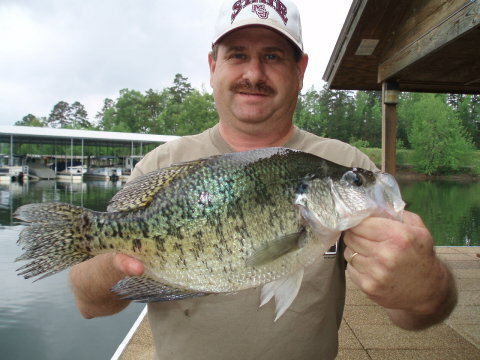 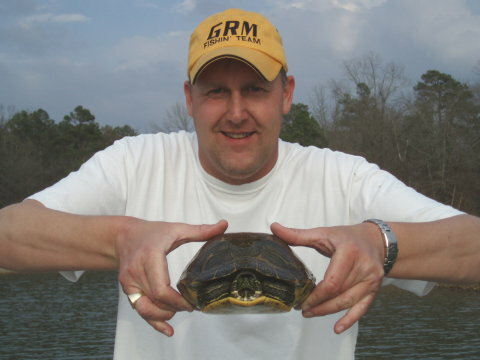 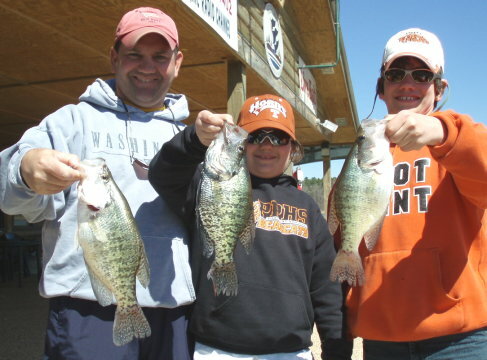 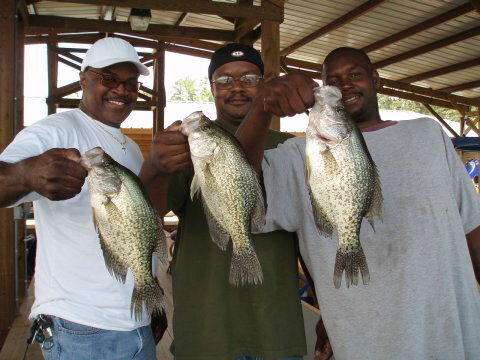 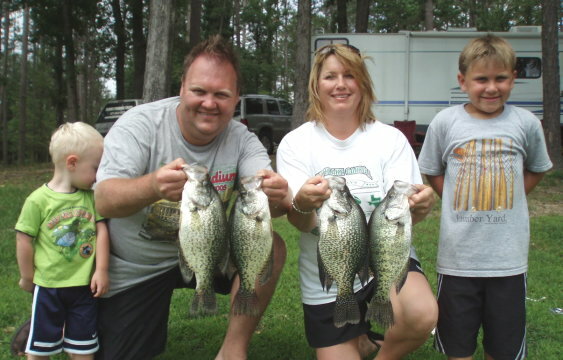 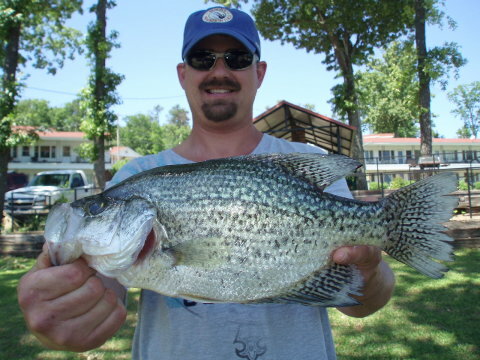 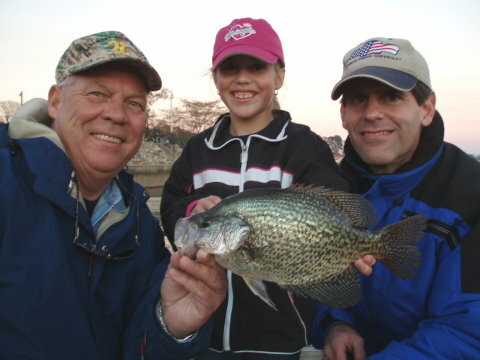 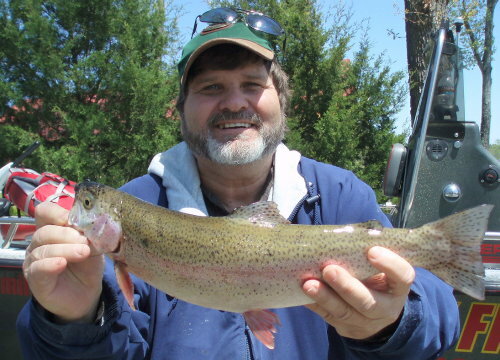 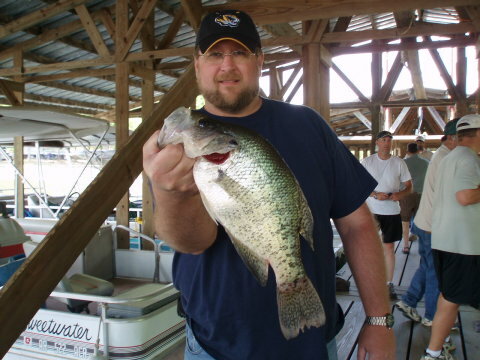 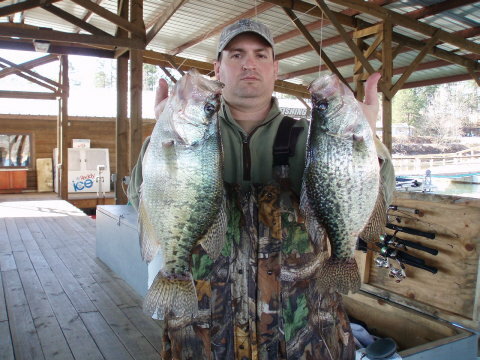 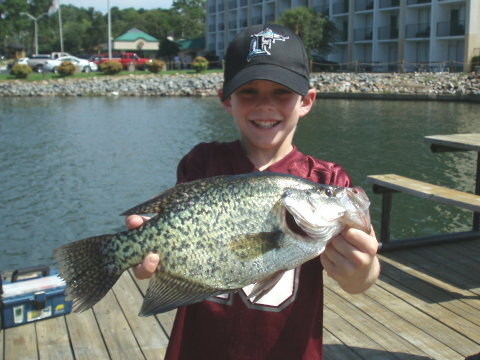 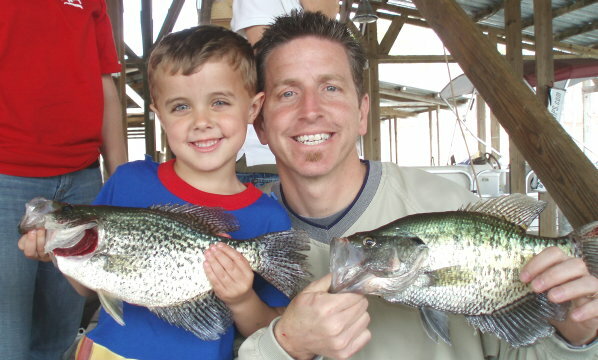 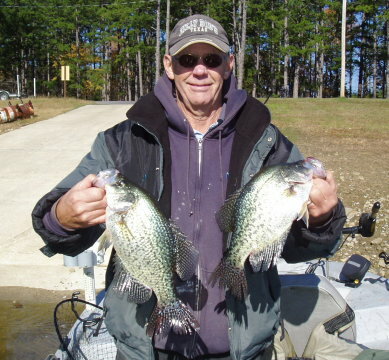 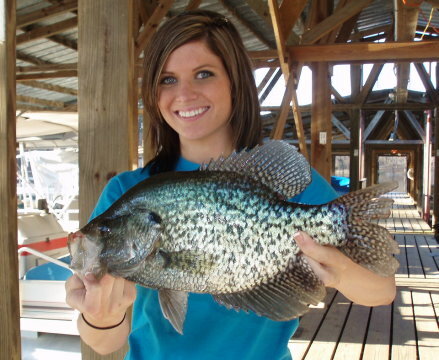 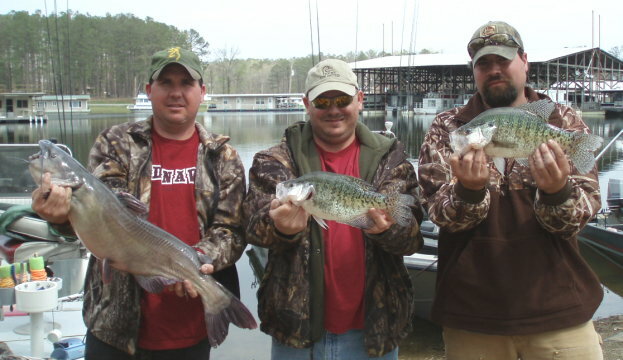 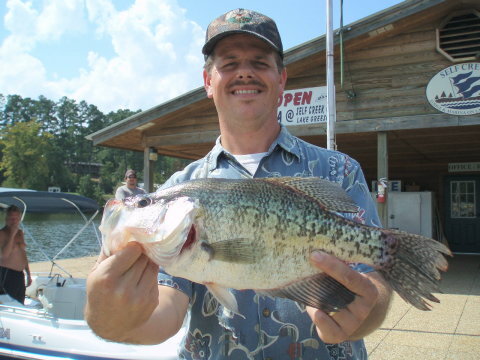 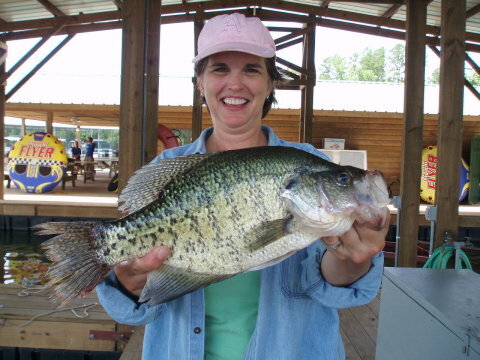 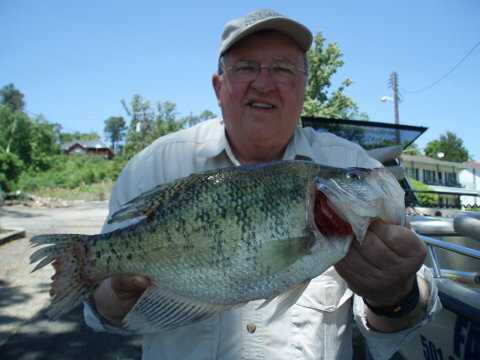 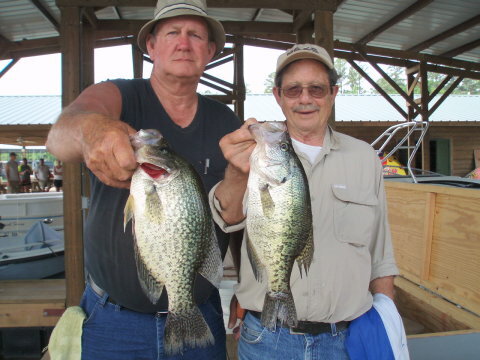 14" Black Crappie 1lb.14oz., 16" White Crappie 2lbs.2ozs., 15" White Crappie 1lb.15ozs. 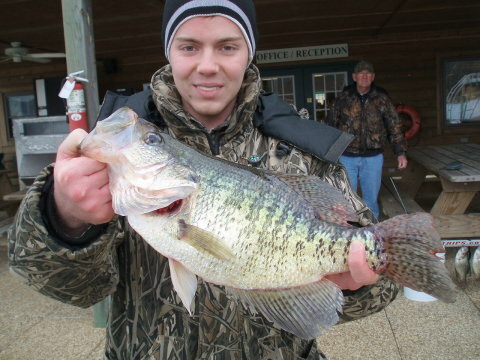 White Crappie 16.5"/2lbs.8ozs. 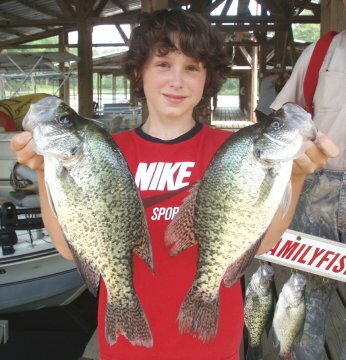 - Black Crappie 15"/2lbs.2ozs. 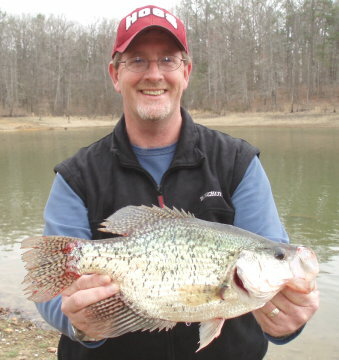 White Crappie 16.5" - 2lbs.4ozs. 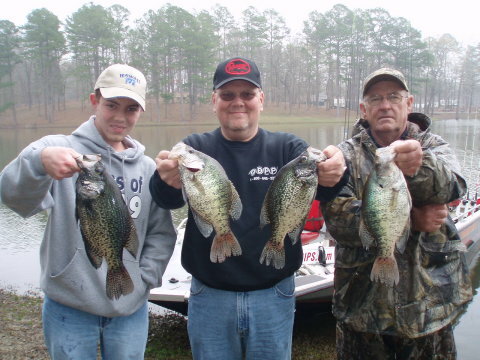 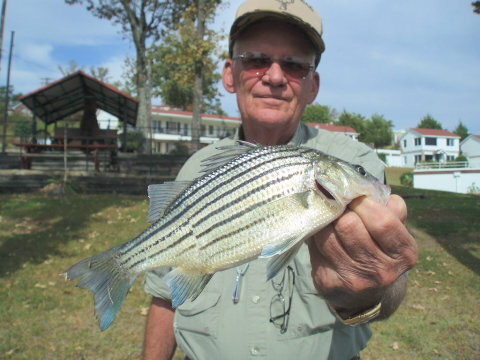 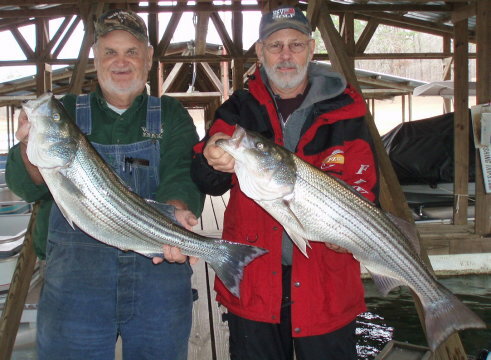 Hybrid Crappie 2lbs.3oz., Largemouth Bass 2lbs.8oz., White Crappie 2lbs.2oz. 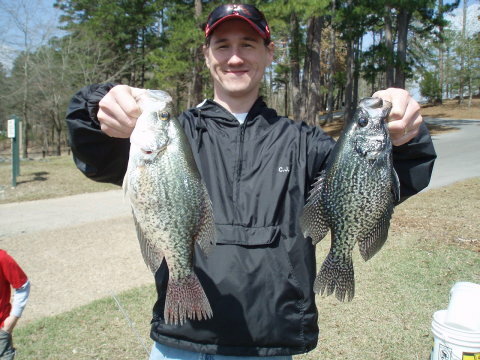 15" Black Crappie 2lbs.2oz. 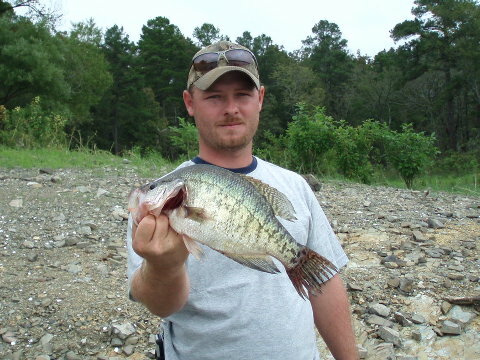 and a 17" White Crappie 2lbs.8oz. 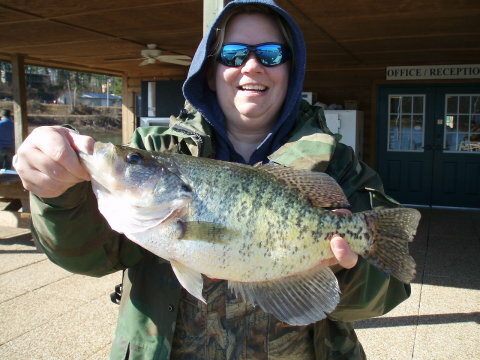 15-inch Black Crappie weighing 1lb.12oz. 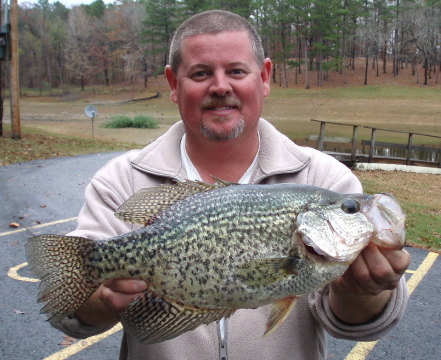 Black Crappie 16" - 2lbs.5oz. 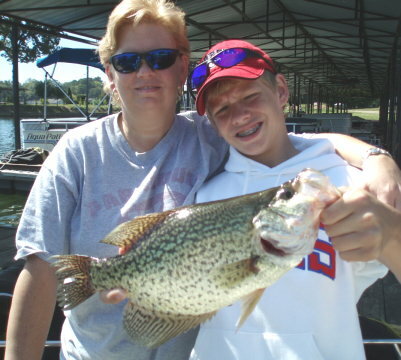 Black Crappie 14.75" - 1lb.13oz. 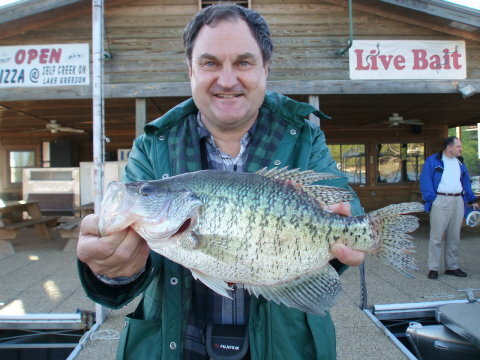 White Crappie -- 15.5" -- 1lb.12oz. 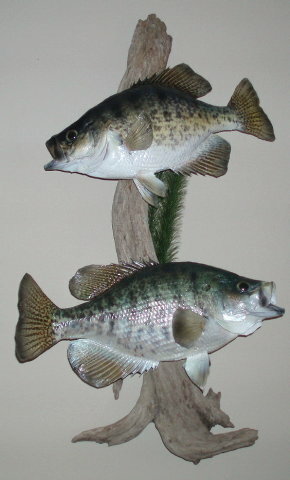 Black Crappie - 16" / 2lbs.1oz. 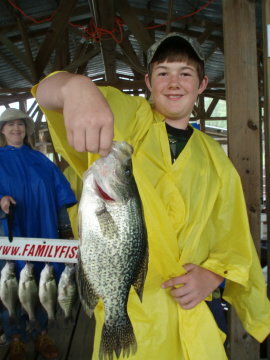 and a Black Crappie - 14.5"
White Crappie - 16.5" / 2lbs.2ozs. 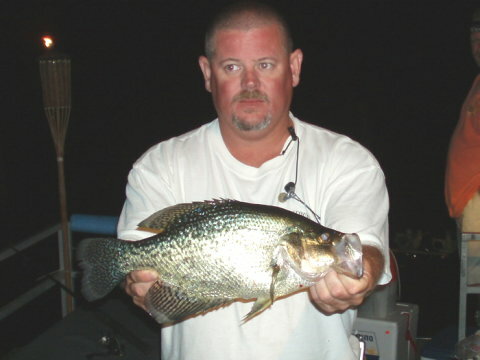 Dog-Days White Crappie -- 15.75" -- Great Job Snoop Doug!!! 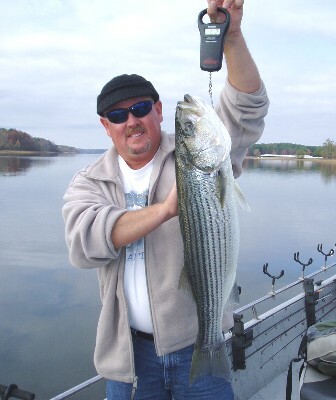 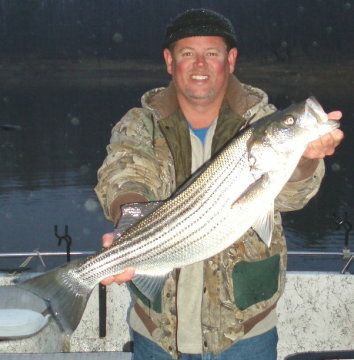 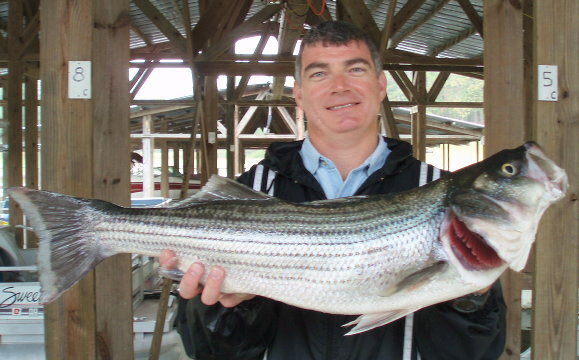 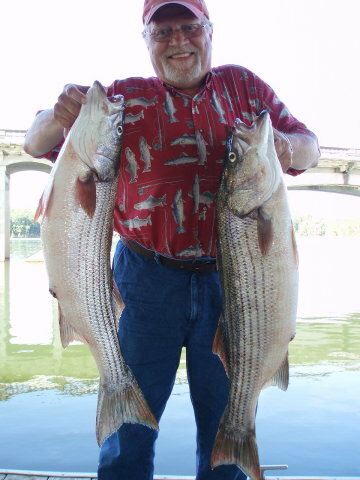 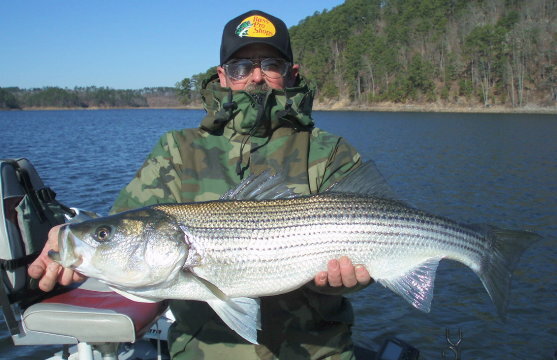 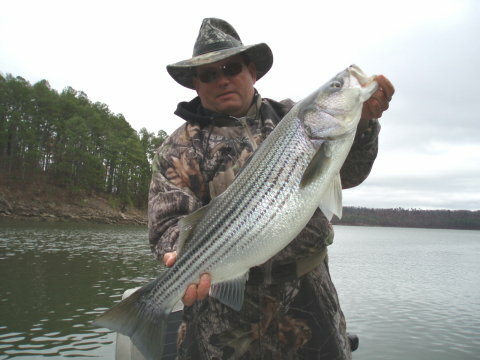 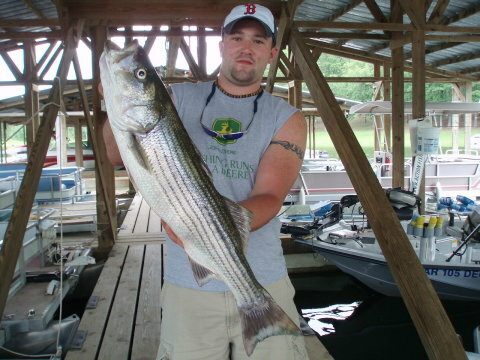 Striper -- 10lbs.12ozs. 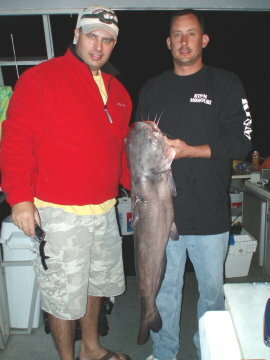 and 13lbs.8ozs. 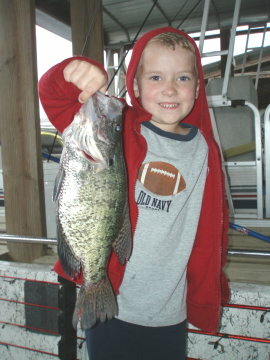 -- Great job Parker!!! 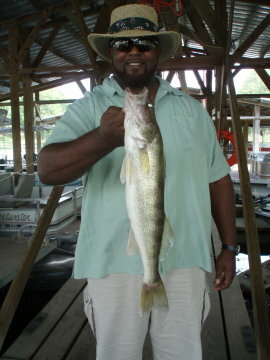 -- You the Man and I bet your sister is going to love see this. 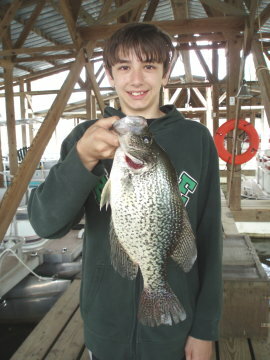 White Crappie 15.75" / 1lb.14oz. 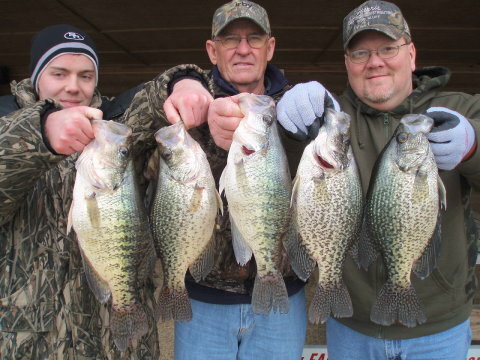 Four White Crappie from 15" to 15.75"
with a 1/16th ounce jig on a crappie pole with 6-pound test line. 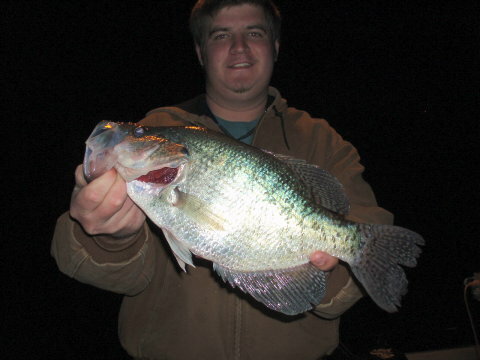 16" White Crappie that weighed 2lbs.4ozs. 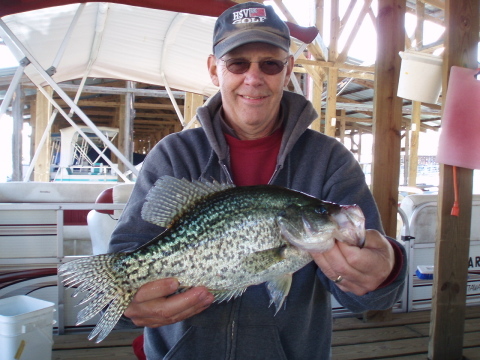 Black Crappie, 1lb.8oz. 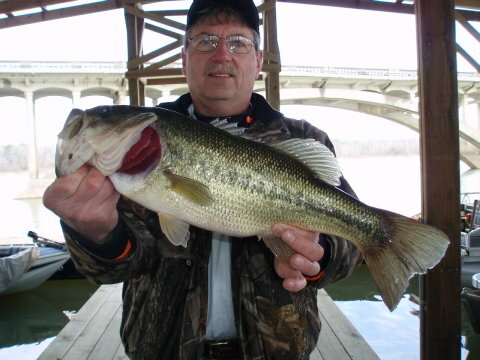 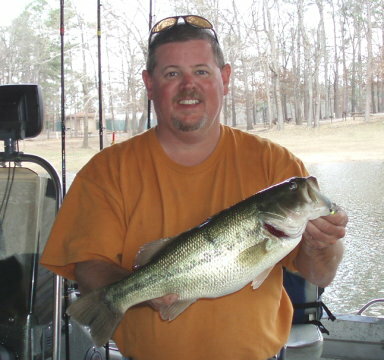 -- Largemouth Bass, 2lb.10oz. 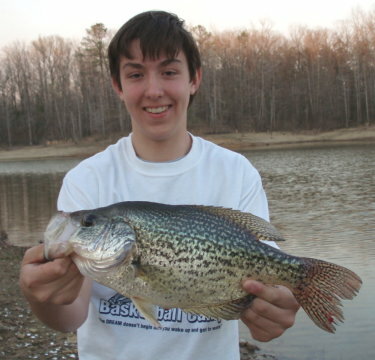 Black Crappie, 14.5", 1lb.10oz. 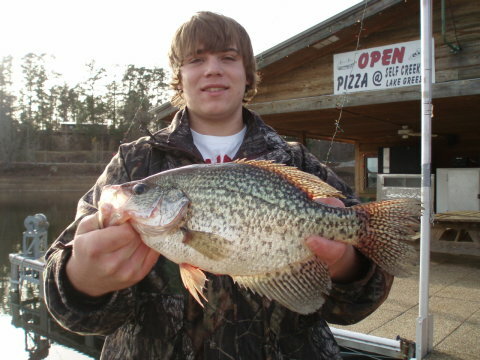 -- White Crappie, 16", 1lb.15oz. 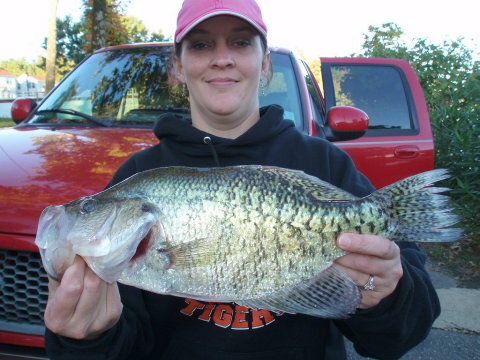 16.5" - 2lb.2oz. 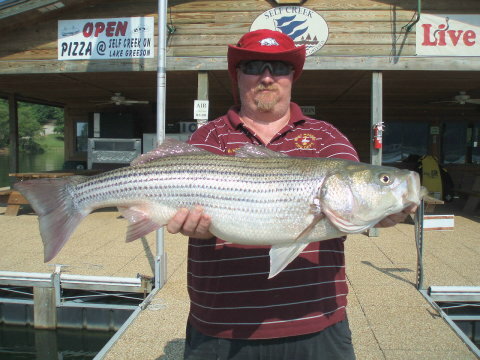 and a 16" - 1lb.15oz. 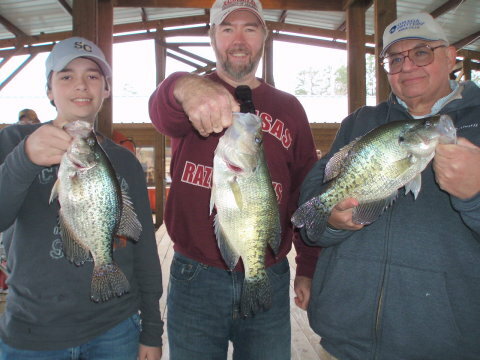 Two 15" Crappie and a 14"
Black and White Crappie - Two 14", One 14.5" and a 16"
Two 15" Crappie, one Black and one White, Jonah's was one ounce heavier than dad's! 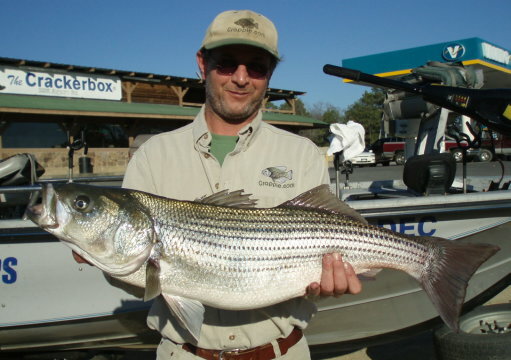 Hybrid White Bass up to 7.5lbs. 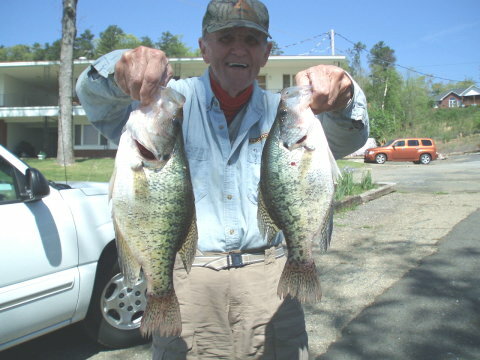 Somebody put a whoop'in on ole dad!!! 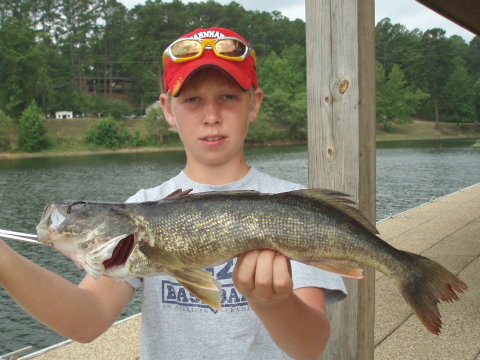 Way to go, Jesse!!! 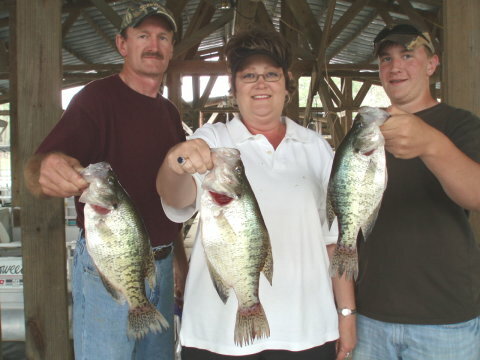 Black and White Crappie 14 and 15"
White Crappie up to 14"
Large Turtle (released) ---- Two 16-inch Crappie -- Female 2lbs.3oz. 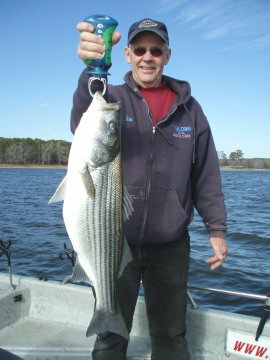 and Male 1lb.15oz. 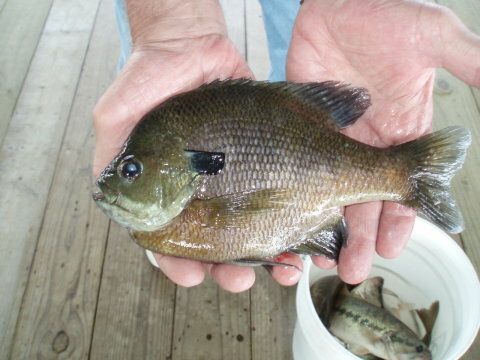 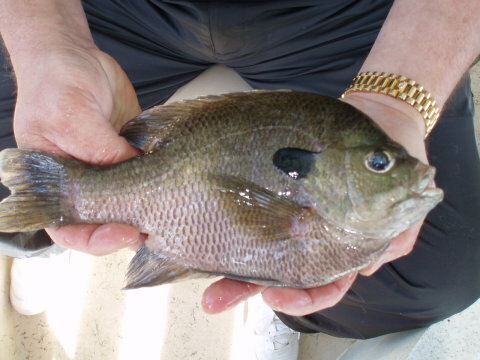 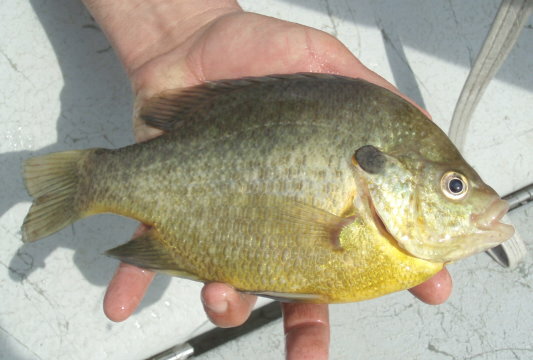 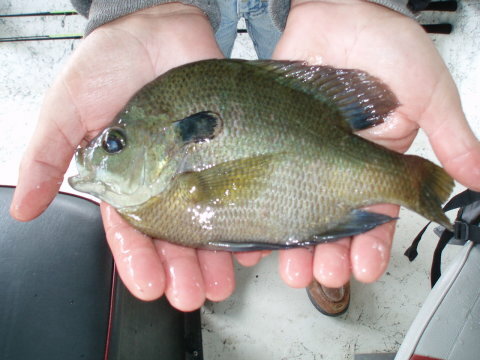 Red Ear Bream over 1 pound - 10" long -- Bigger than your hand as you can see. 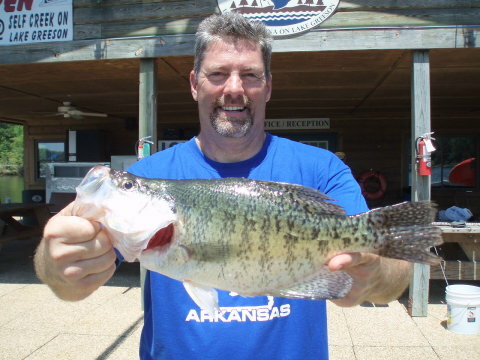 Black Crappie - 15.25" / 1lb.14oz. 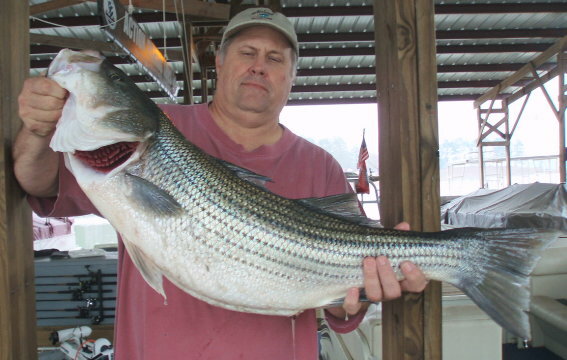 The biggest so far this year and it's going on the wall. 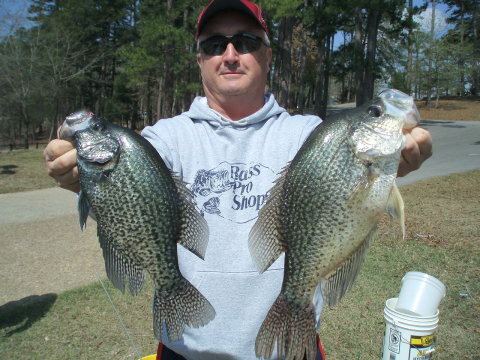 5 Slab Crappie all over 14"